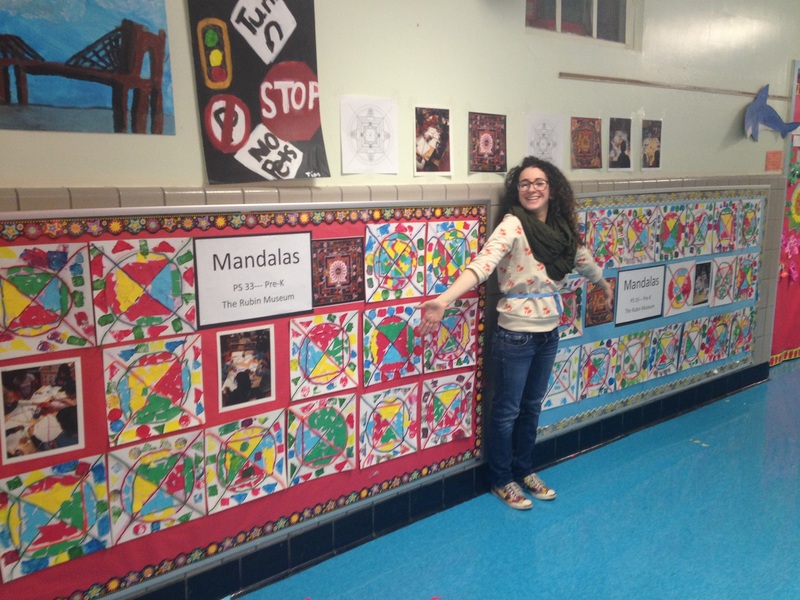 Asya with the Mandalas created by the Pre-K classes! For the second year in a row, I had the pleasure to teach the Thinking Through Art residencies at PS 33 in Chelsea. 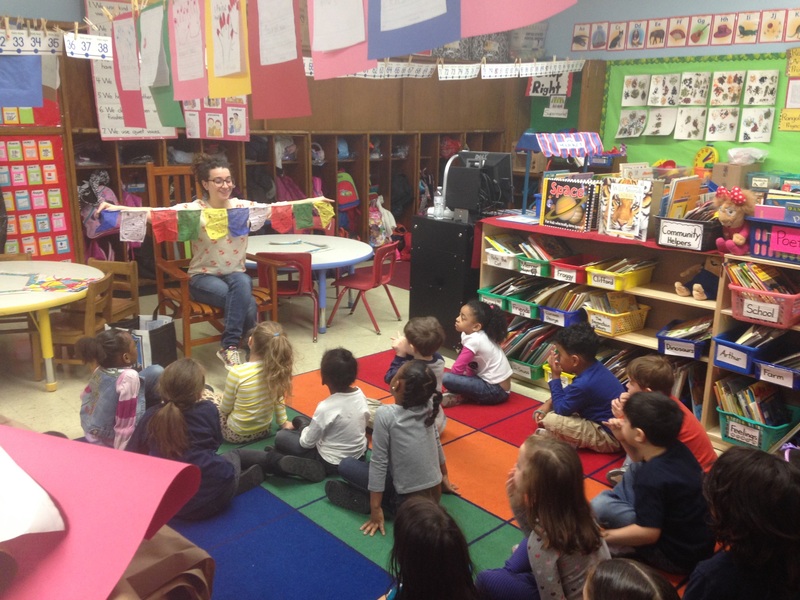 Teaching the cultures and traditions of the Himalayan region to students in Pre- K and Kindergarten classes, allows me to think deeper about creating multiple entry points into really big ideas. Together we are able to learn about different cultures, responsibilities and the interconnectedness of the world through exploring themes unique to the Himalayan traditions as well as relevant to our lives in New York. We began the year by learning about the Himalayan Mountains and the surrounding regions. 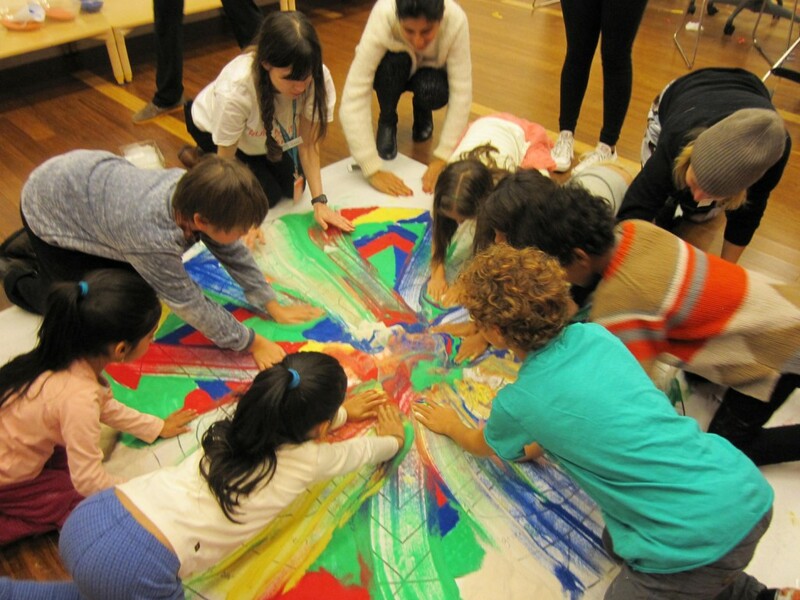 The students then created their own mountainous landscapes; it was up to me to convey the magnitude of the landscape to students that might have never left the urban landscape of New York. Through embodied play, we pretended to scale the Himalayan Mountains as we gasped for oxygen, tried to keep warm and enjoyed the vistas of the region from the top (and some students helped us envisioned dragons perched at the peaks). Looking closely at Thankas, found in the museum collection, we drew our own scrolls depicting our community while comparing our daily life to that of a child in Nepal. 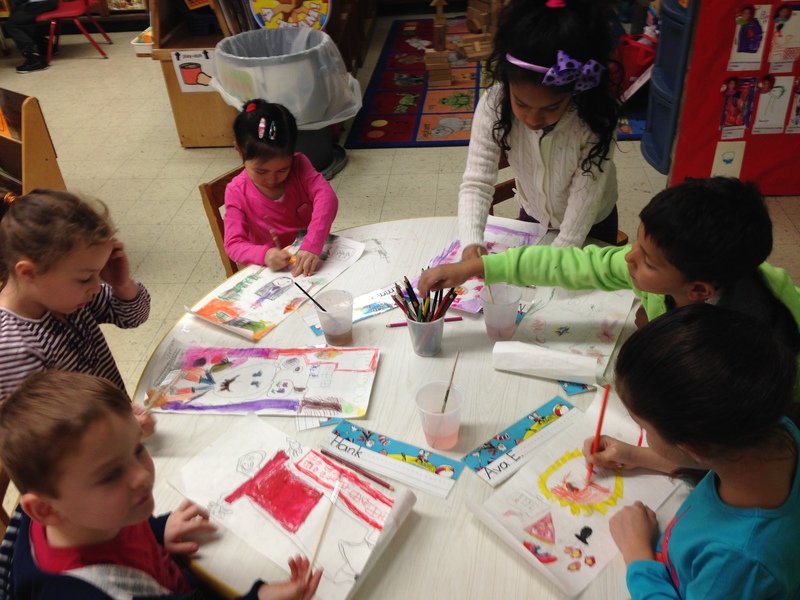 K students working hard on their scrolls! 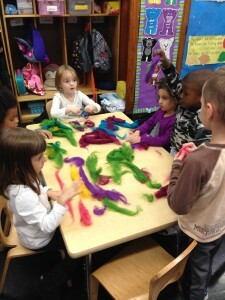 Feeling all of the wool, getting ready to do some wet felting! 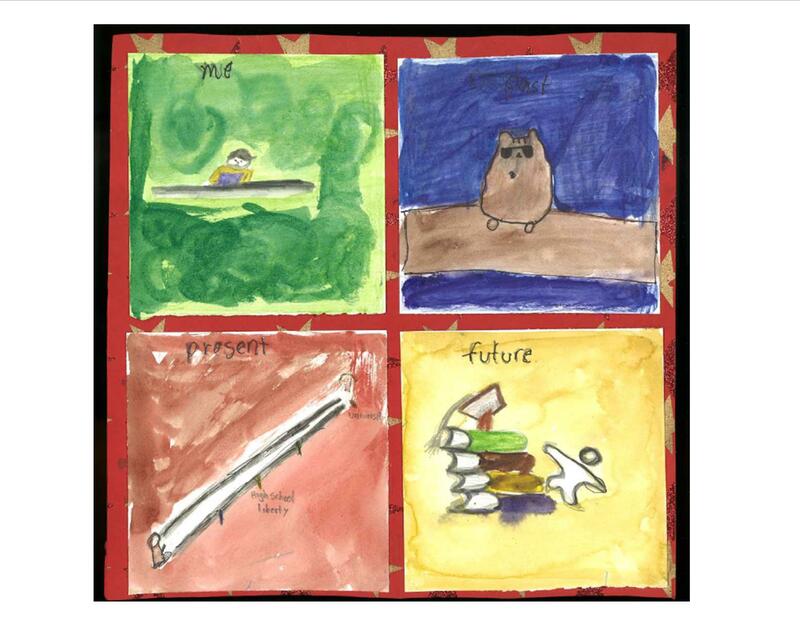 In designing their own wish flags, students discussed the importance of putting time and decorations to make them “special” and important as they make their own wishes. Hermaine wished for bunk beds; Ashton drew all 12 Transformers that he wished to get; Lexi wished to ride a unicorn over rainbows, and Raina’s wish came true when it snowed so much one-week. 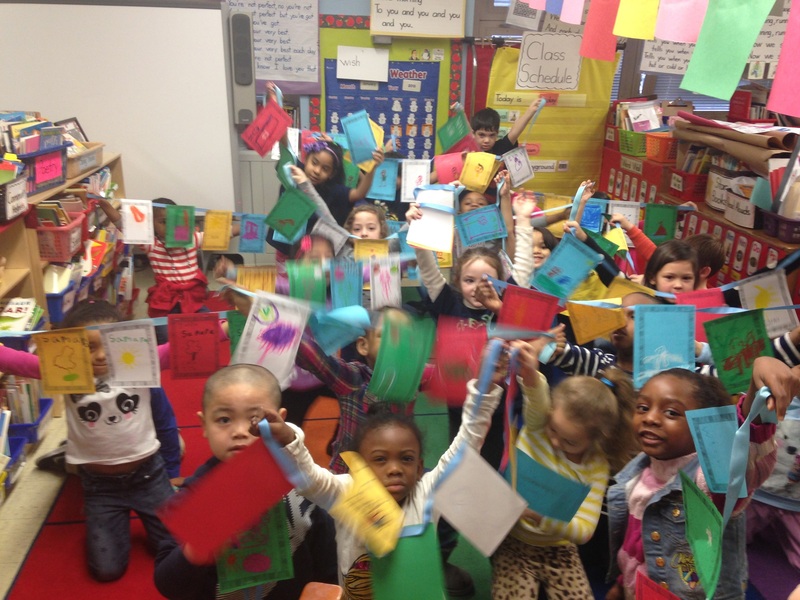 Looking at the prayer flags all together! The final product! Our very own wish flags! 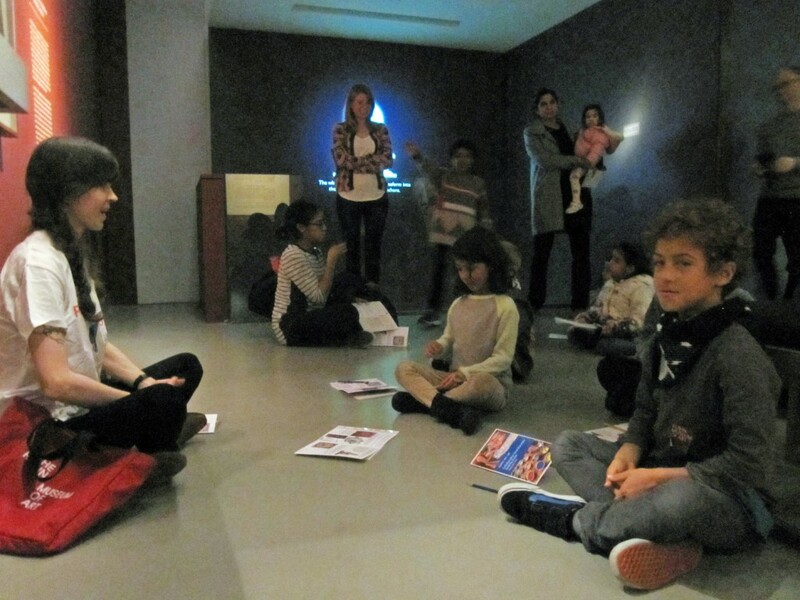 As the culmination of the Fall 2014 residency, the Pre-K and Kindergarten classes visited the galleries of the Rubin Museum, (also known to some students as the place where Asya lives) for art making and deeper exploration. Sharing our classroom experience with parents enables the learning to continue beyond the classroom. Students feel empowered to share their knowledge with their parents and continue these thoughtful conversations at home. A special thank you to Mrs. Lindy, Ms. Harvey, Ms. Burns, Ms. Scott, and Ms. Georgantonisas well as the classroom support teams and all of the parents of PS 33 who helped us make this such a positive experience! My name is Ankita Mishra, and I have been a Teaching Artist here at the Rubin Museum through the Thinking Through Art (TTA) program for almost three years. What always strikes me at the close of a semester is not just the overwhelming sense of calm, pride, and exhaustion, but the knowledge that I have experienced something authentically new and refreshing. No matter how many classrooms and lessons I facilitate, not one is the same as the last. I taught two residencies at the nearby Liberty Highschool for Newcomers on 18th Street between 7th and 8th aves. One was a standard residency on par with my previous Thinking Through Art experiences– that is, approximately 6 to 8 weeks long, with me visiting the classroom once a week. Alongside this I taught a shorter residency just three sessions long with a Health class. 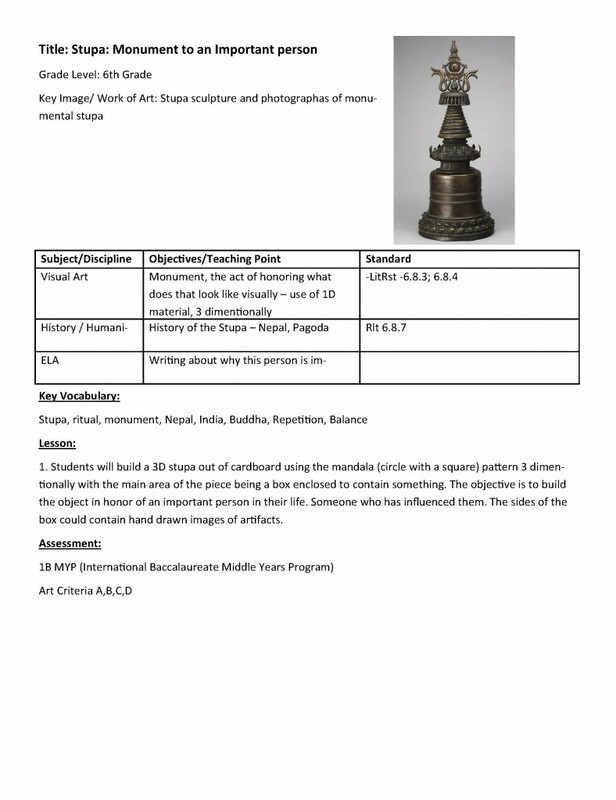 One of the beauties of the TTA Program for me is this interdisciplinary aspect, where Himalayan art from our collection gets a chance to connect to all subjects of study. For instance, Ms. Lei’s 10th grade Health class was a mix of students from all backgrounds: Haitian, Egyptian, Chinese, Dominican, and Pakistani, to name a few. 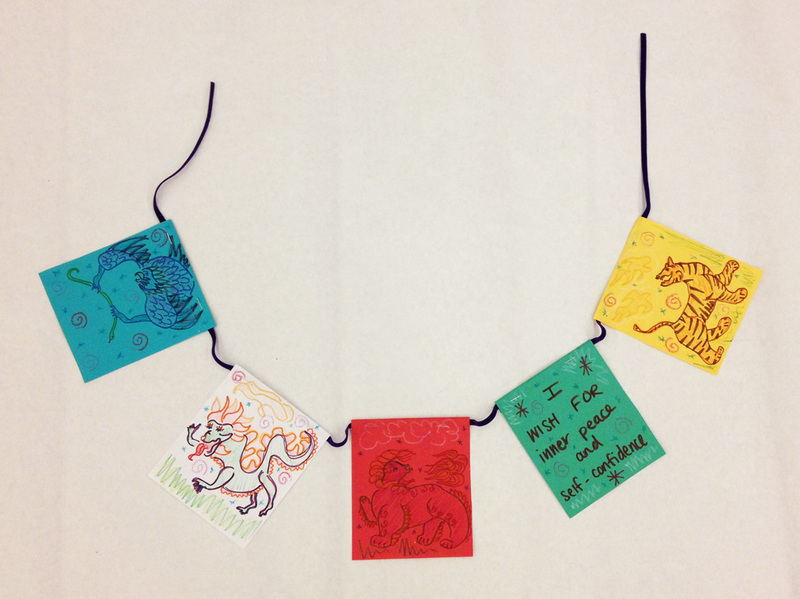 Our project was to make amulets, filling them with healing spices and wishes for good health. Through this project we discussed the function and significance of a Mandala and focused on ways and goals to better oneself. This idea resonated with my students immensely. 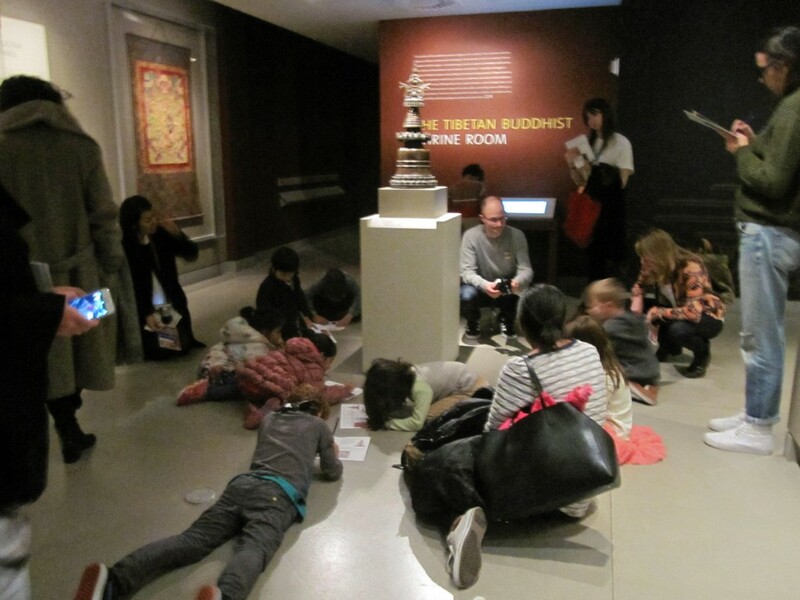 My favorite lessons with this class took place at the museum, seated in front of a mandala on the 5th floor. 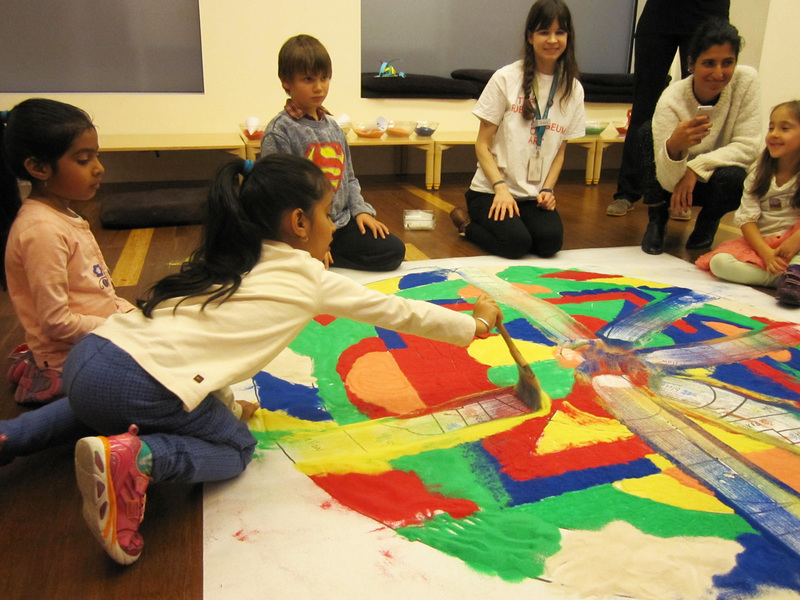 Students were given Mandala worksheets and asked to fill them in with drawings of what was healthy and what was not, placing themselves at the center of this Mandala. At the end of the workshop, we folded each mandala into a square, filling them with healing spices and wishes for the future, and then wrapped them with colored string. Some students even chose to make them into necklaces, and wore them proudly throughout the day. For Ms. Burd’s classroom, the project was slightly longer and more involved, lasting about 6 weeks. 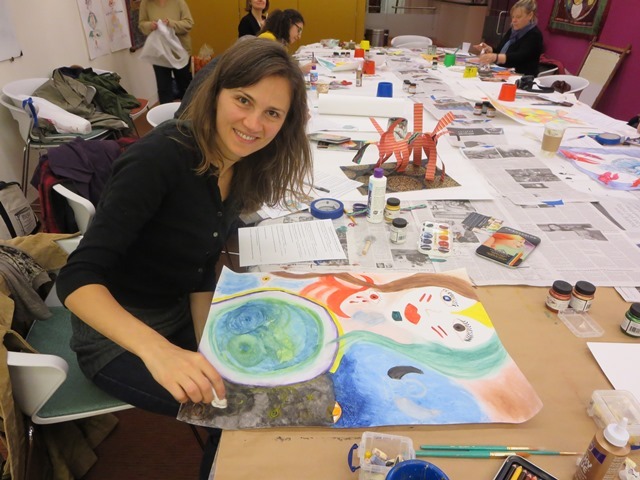 Their workshop was directly inspired by Francesco Clemente’s paintings and the billboard-style watercolor posters found in India. 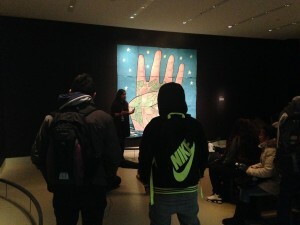 Again, the students were asked to take their personal life experiences and connect them to Clemente’s pieces. They responded well to the storytelling aspect of the workshop– the most special and compelling part about working with students from so many different backgrounds are their personal stories. 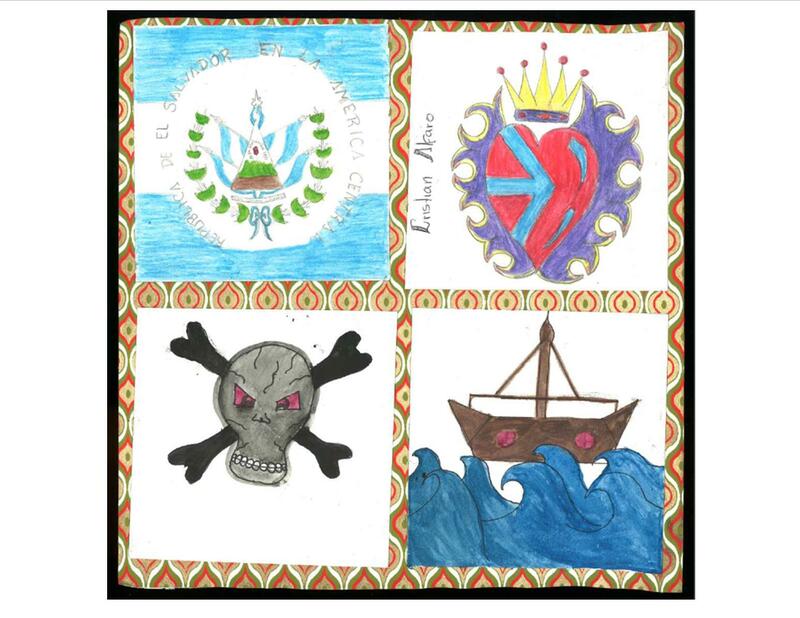 What proved to be more challenging was taking their stories and translating them into visual symbols. Ms. Burd and I worked closely with the students to help them find a symbol that helped express what they wanted to relate to others. Because the students at Liberty vary in English literacy levels, the one-on-one approach proved to be extremely useful in this classroom. At the end of the workshop, Ms. Burd’s students all gathered at the Education Center during their class period to present their work formally. This chance to reflect and observe each student’s work is a feature of the longer residencies that I truly enjoy. This particular class, unlike some others that I’ve taught, was a bit more timid. They responded to lots of positive reinforcement from their peers (at one point I and some other teachers had to push them into it). Mic in hand, they each told us about their personal symbols and elaborated on their stories. Though each classroom is different, I ended this semester with a full heart as always. Watching my students succeed at connecting to the content I had presented to them and overcome their fear of public speaking (in a language they were not yet confident speaking in) was the biggest accomplishment of all. 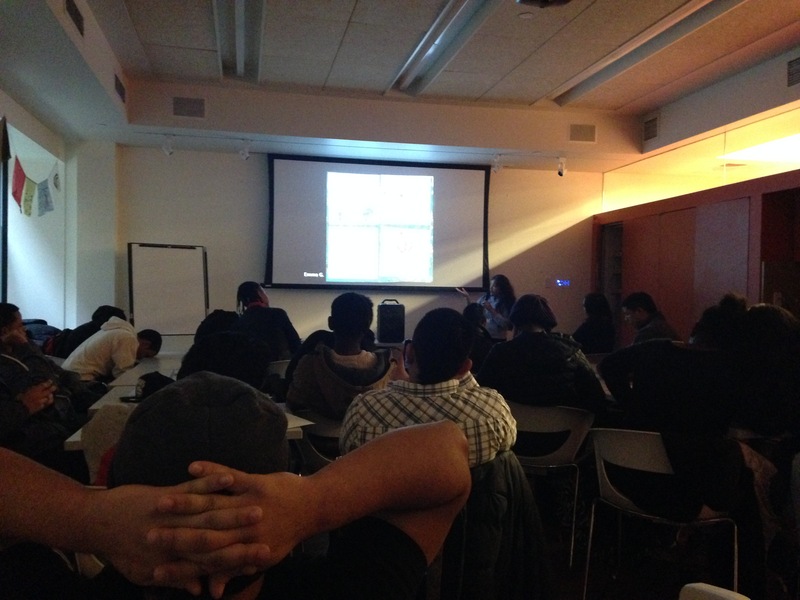 Student presentations in the Education Center! 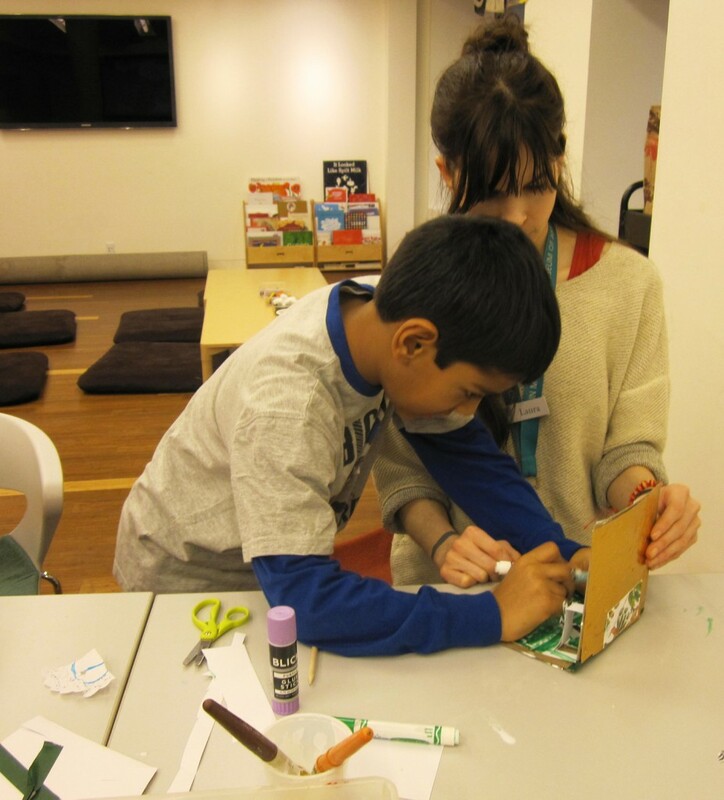 Last weekend we hosted our December Family Art Lab focusing on the art of books and their importance in Tibetan Culture. 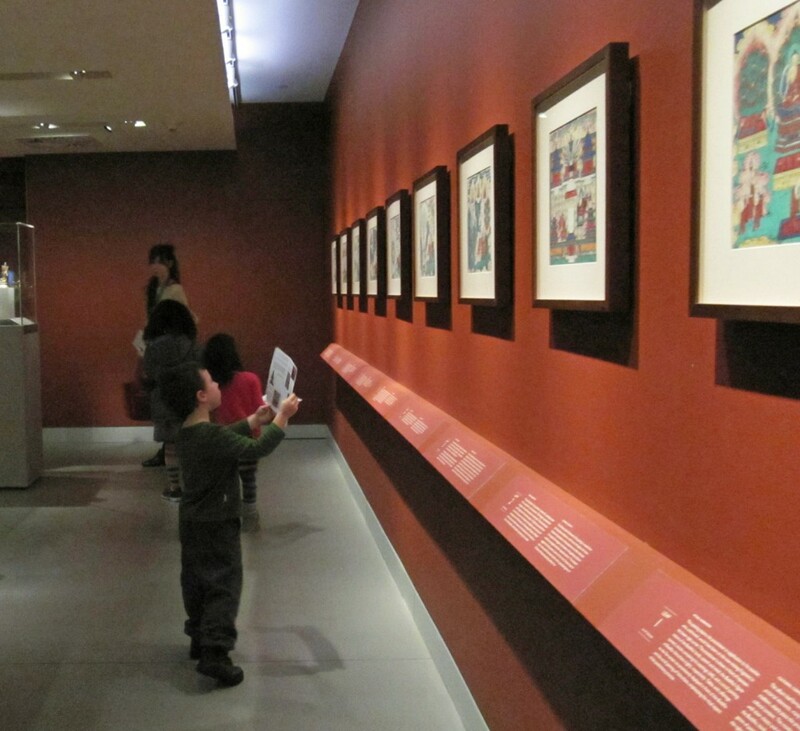 We began with an exploration of the exhibition, All-Knowing Buddha: A Secret Guide, focusing on a set of 54 paintings that are thought to be album leaves from 18th century China. 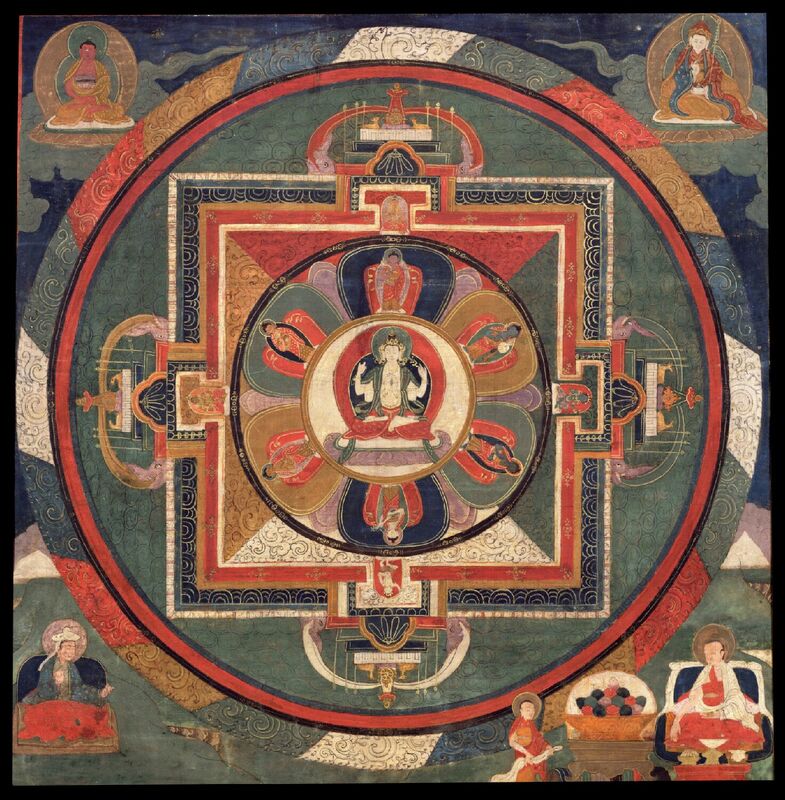 Each of the paintings visually depicts the meditation practice of the All-Knowing Buddha. 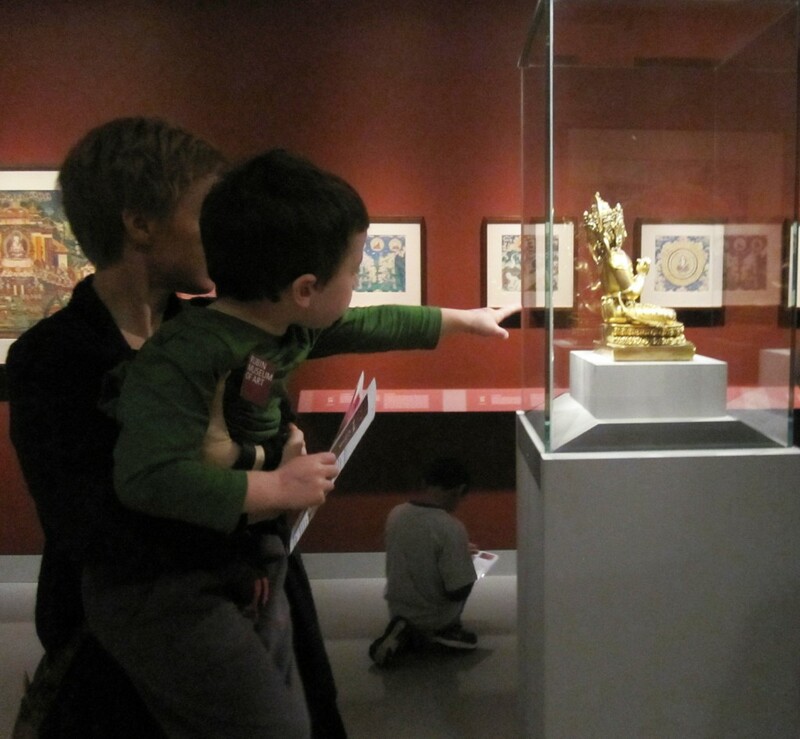 On this tour, families discovered what it means to “visualize” and how artwork can be used as teaching tools. 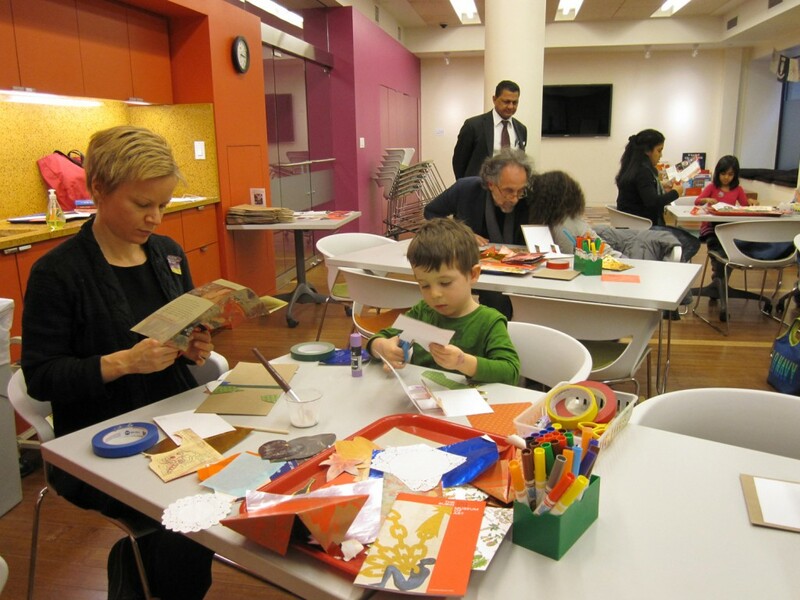 After exploring the galleries, we went to the art studio to begin creating our pop-up books. 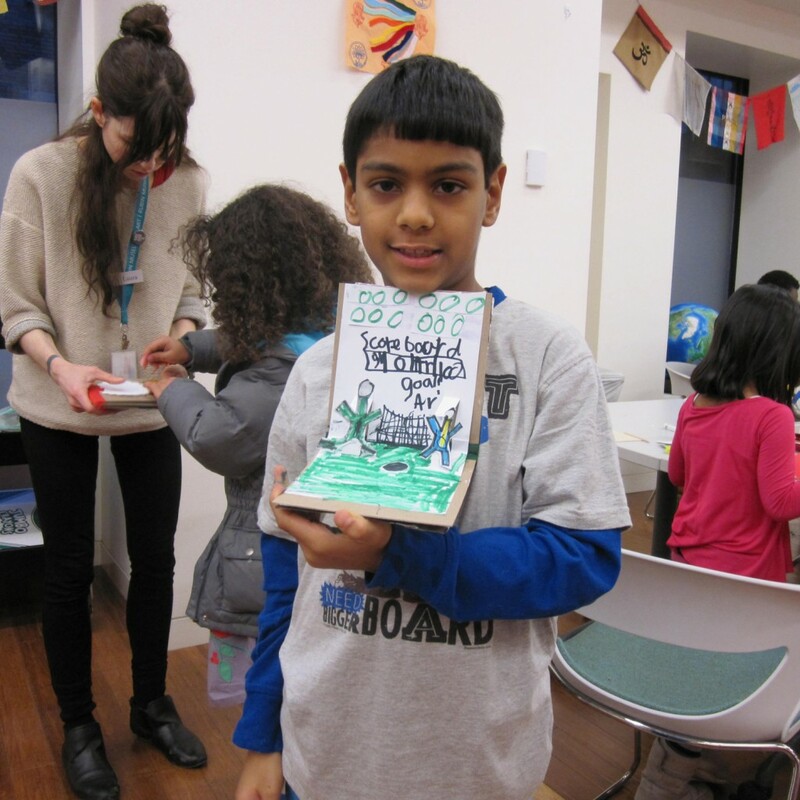 We used recycled materials to construct our books, learned new binding techniques, and experimented with different ways to make our pages pop! Families came together, working as a team on their books and the results were really amazing! We believe it’s important to sign your work! 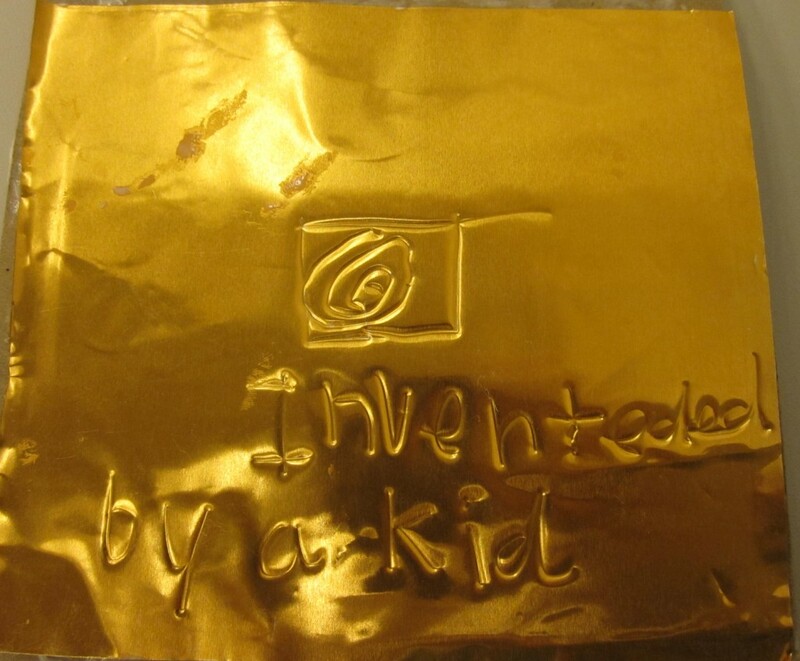 – “Invented by a kid”. 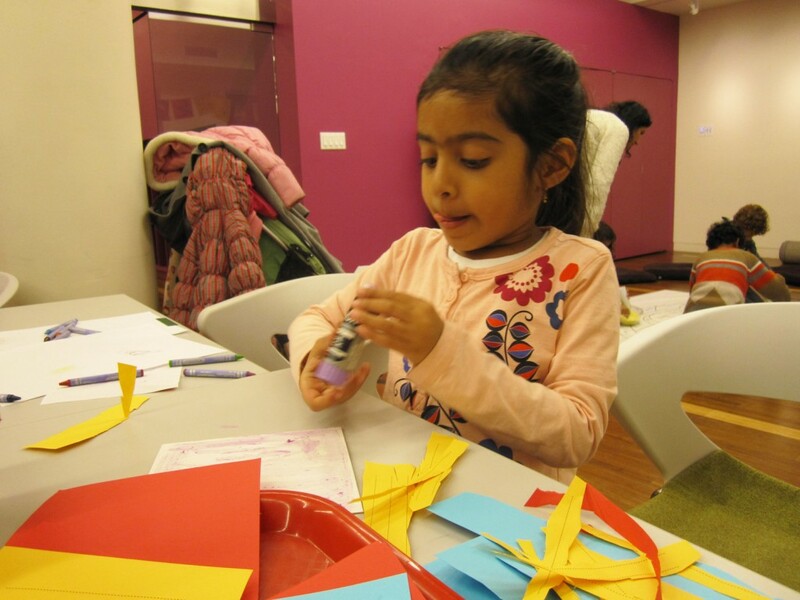 In January we’ll be celebrating Makar Sankranti, the Indian Kite Festival at Family Art Labs and will create our own traditional Indian Kites! We hope that you can join us. 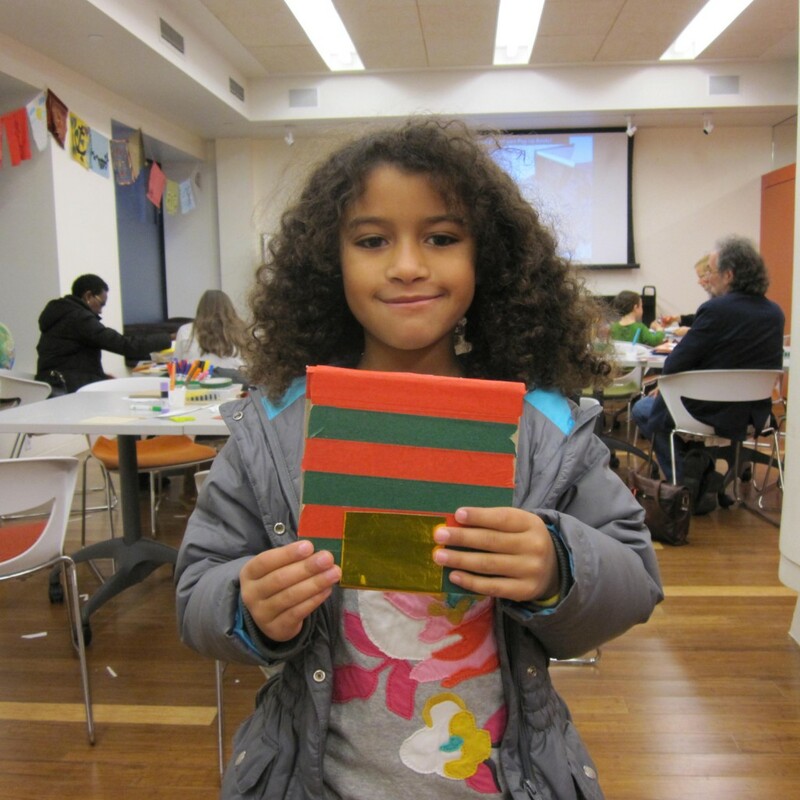 Until then, happy holidays and happy new year from the Family Programs team! 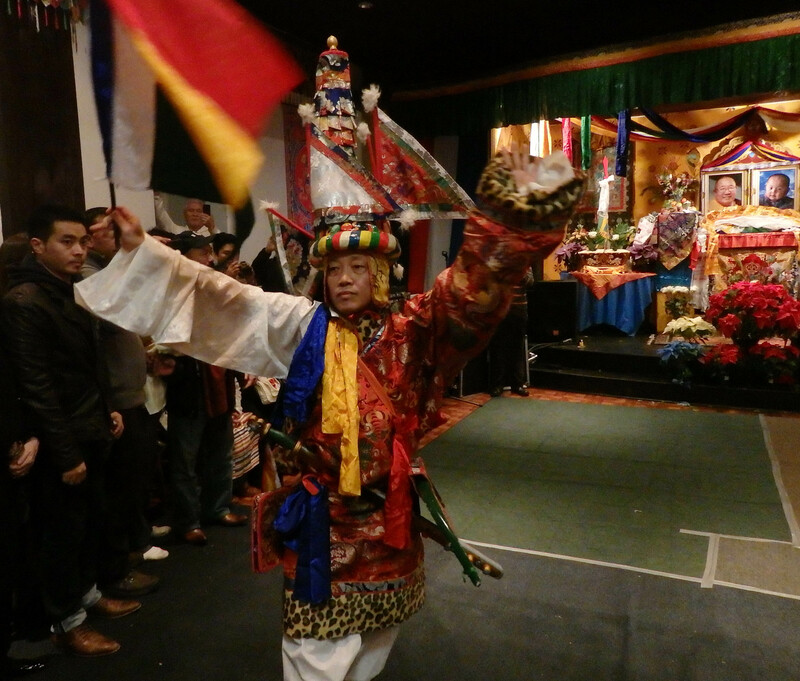 The final Himalayan Heritage Meetup for 2014 was an uplifting event. We were fortunate to welcome Gen Wangdak Taksar La (in Tibetan, “Gen…La” is an honorific for teacher) to the Rubin Museum to share his knowledge of traditional song and dance from Tibet. Wangdak Taksar is a master of Lingdro, a dance form that celebrates King Gesar an Enlightened King who is the subject of inner-Asia’s longest and most popular epic. Gen Wangdak La is the holder of this lineage through his family in Tibet, who were well known Gesar dancers, and is the founder of Lingdro Dechen Rolmo, a dance group based in New York City who performs and leads workshops throughout the year. 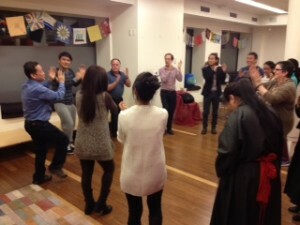 The workshop included a diverse group of Tibetans who regularly participate in the Lingdro dance group as well as newcomers. 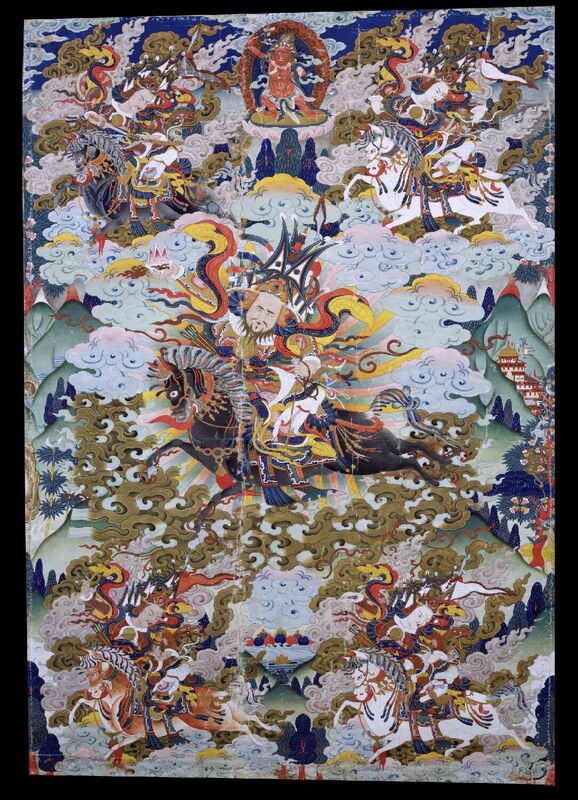 Gen Wangdak La taught a song praising the Buddhas of the five directions (East, South, West, North, and Center), which also correspond to the directions of a mandala.Each verse had a different melody that invokes the enlightened activity embodied by the deities of the five directions. This is said to pacify negative emotions, increase positive circumstances, magnetize auspiciousness, destroy obstacles, and encompass the wisdom of limitless space. Afterwards, he taught the group the lively and festive dance that accompanies these songs. It is performed in a circle and would have traditionally been performed outside for hundreds of devotees during major festivals and other religious events. 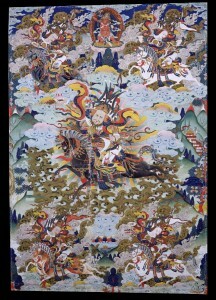 It was a pleasure and honor to host Gen Wangdak La at the Rubin Museum. The evening was full of laughter and concentration as we all tried to learn these sometimes-complicated and always beautiful melodies. There were also some very interesting conversations between those who were new to Lingdro dance and Tibetan singing, and those who have been practicing for years. In all, there was a sense of joy around learning this ancient form in such a modern setting. We’re looking forward for Gen Wangdak La to come and teach again! On November 4, Election Day, the Rubin help a professional development workshop for K-12 teachers. 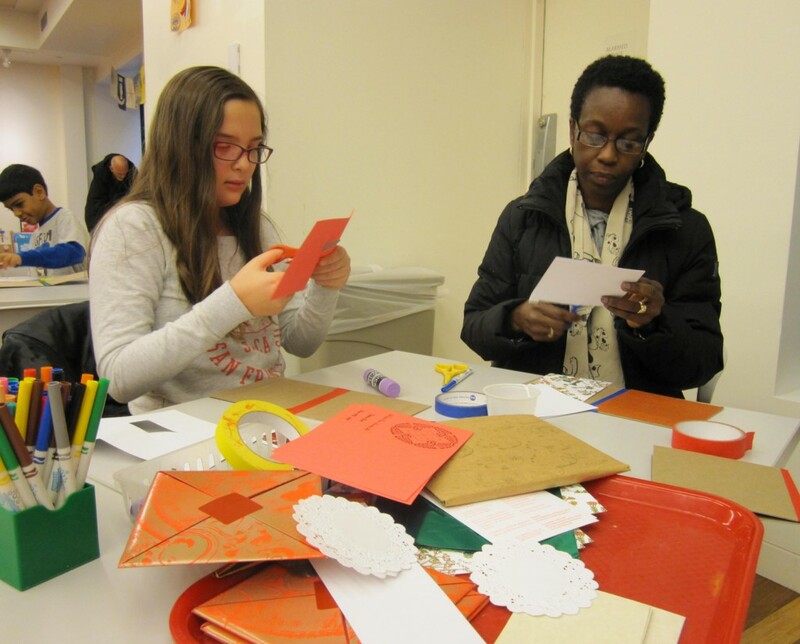 The theme of the workshop was Art as a Cross Curricular Connector, focusing on how the Rubin Museum’s collection can be used to complement a wide range of subjects, from math to ELA and from science to art. 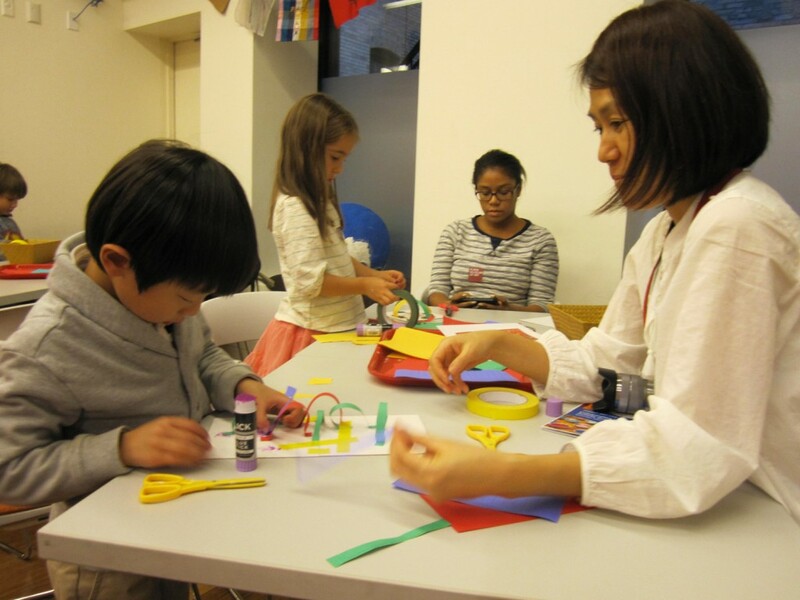 Our goal was to help teachers understand how the Rubin Museum can help their teaching and to use the teachers’ expertise to bring new and innovative ideas to the table. We were also hoping to open the door for more collaborations between teachers and museum educators and also teachers with each other. What are you hoping to learn/share/experience today? What are the benefits of teaching cross-curricularly? 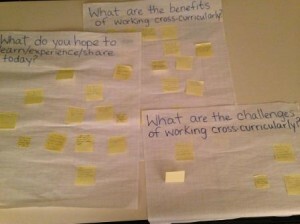 What are the challenges of teaching cross-curricularly? Each answer was thoughtful and resonated with other participants. This brainstorming helped us understand where the teachers were coming from. During a quick Artifact Investigation Workshop, teachers used the hands-on teaching collection to warm up their observational skills. 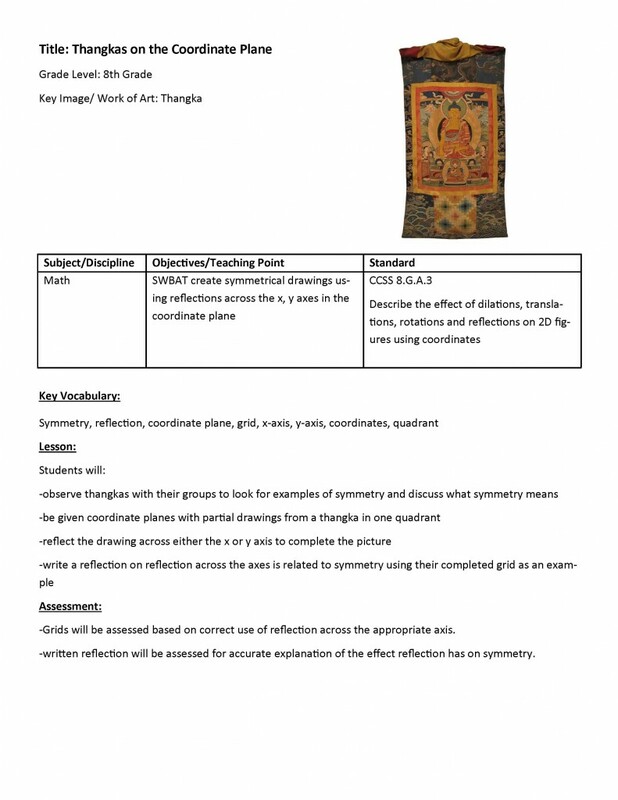 In their discussions and conversations, teachers began to notice that art objects are made of a variety of materials (science), often follow exact measurements and proportions (math), use visual imagery to tell complex stories (ELA), and express complex ideas important to Himalayan cultures and religions (social studies). Afterwards, the teachers had a tour of the galleries during which they learned about key objects from our third floor exhibition Masterworks: Jewels of the Collection. After lunch, teachers participated in a workshop making paints out of hide glue and mineral pigments such as malachite, red ochre, and yellow ochre. 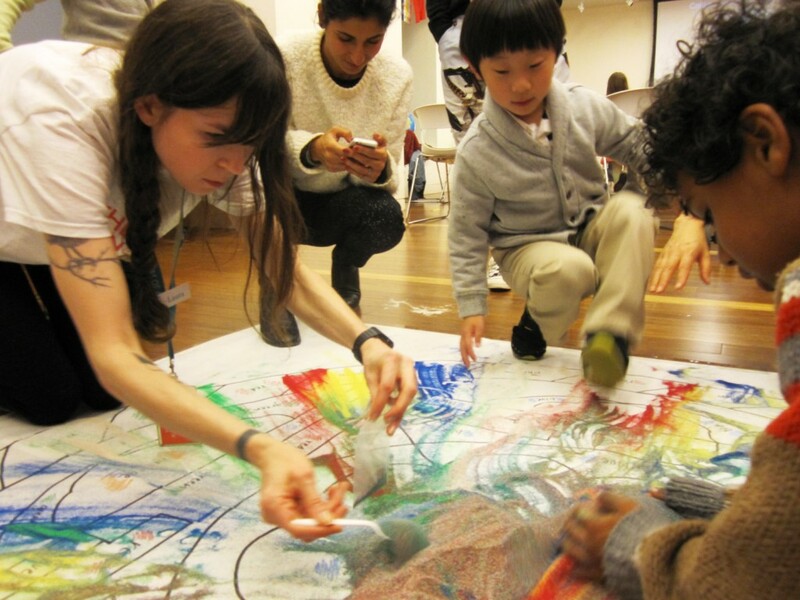 We discussed how the materials used to make art in the Himalayas is deeply tied to its environment. Teachers used the paints to create beautiful Himalayan-style paintings of lotus flowers, clouds, mountains. We hope that this exchange of ideas is the beginning of a longer dialogue between Rubin educators and classroom teachers and we thank all the teachers who participated and shared their expertise. If you participated in the workshop and want to add a comment, we invite you to do so in the comment section below! Earlier this month, the Lincoln Center Theater opened a new play called The Oldest Boy. 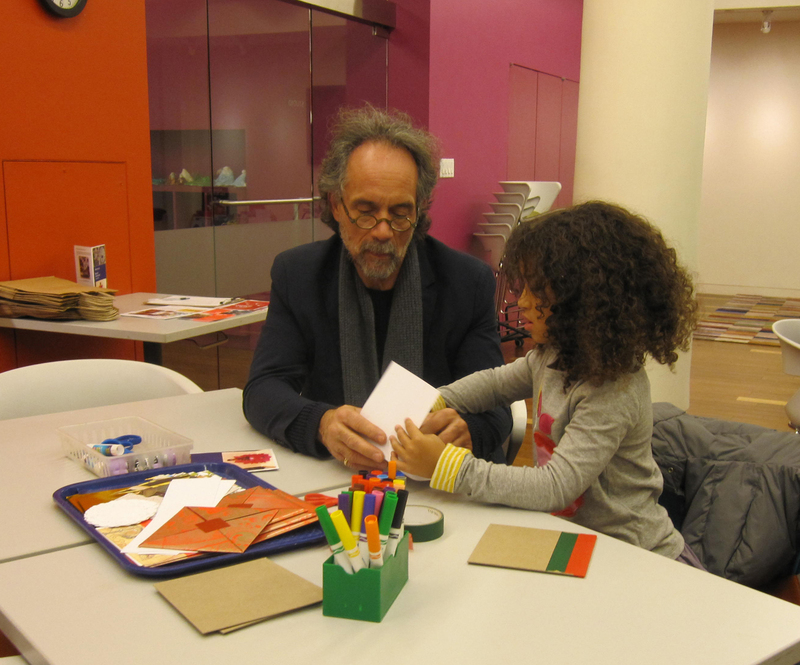 Written by Sarah Ruhl, MacArthur recipient and Tony nominee, The Oldest Boy explores a topic that is near and dear to the Education staff at the Rubin Museum: Reincarnation. The premise of the play is a young boy, born in the United States to a Tibetan father and an American mother, who is recognized to be a tulku, the reincarnation of a high Buddhist lama. The show explores important Buddhist concepts such as rebirth and lineage, but also more universal ideas such as a mother’s attachment to her child and overcoming cultural differences. Many K-12 students have heard of the Dalai Lama and some have a cursory knowledge of Buddhism and some of its basic features such as karma, reincarnation, nirvana. But in most cases the familiarity stops there. 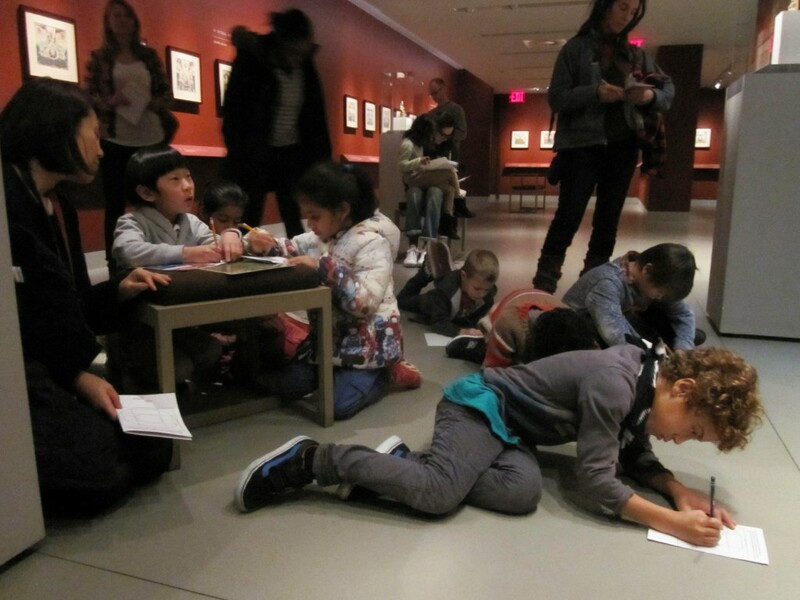 Often these students come to the Rubin Museum to enrich their understand of these and other ideas from cultures in Himalayan Asia through visual art. During the run of The Oldest Boy, many more students are getting the opportunity to see some of these topics in action via the dramatic arts. Through Lincoln Center Theater’s Open Stages program, thousands of NYC public high school students have the opportunity to see plays at the theater free of charge. 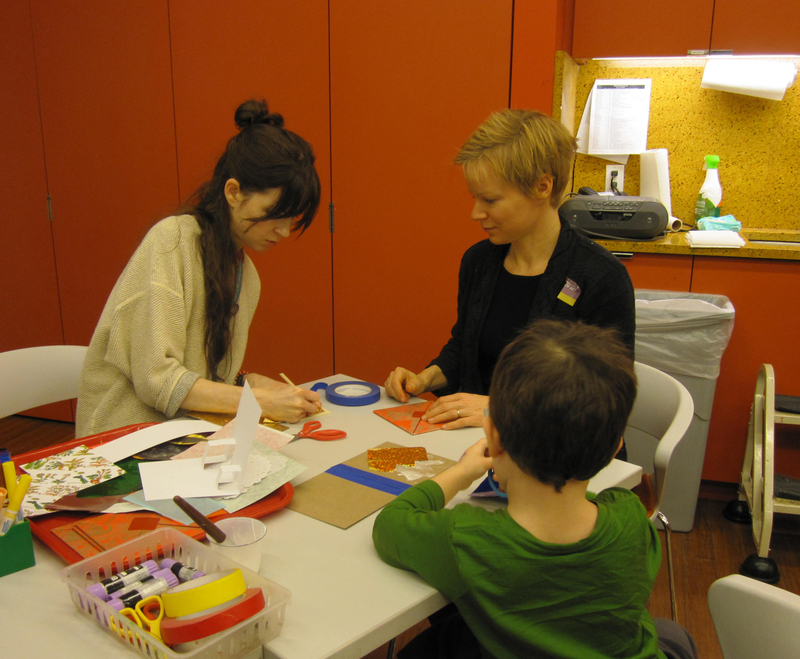 The Education Staff at the Rubin also saw an opportunity in this program. 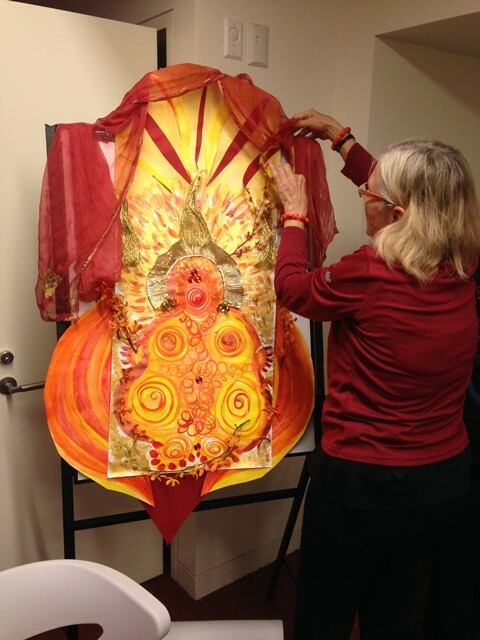 On October 15th, a group of nearly thirty public high school teachers came to the Rubin’s Education Center to learn, for their students and for themselves, about Tibetan Buddhist art. 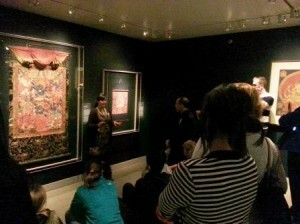 These teachers were all planning on going to see The Oldest Boy with their students, and the Education staff invited them to the museum to see how a visit to the Rubin could enrich their students’ understanding of the play as well as add depth to their understanding of Buddhism and Himalayan art in general. 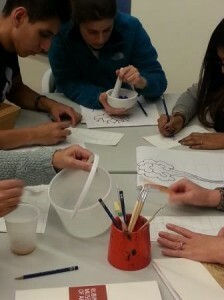 The teachers’ experience began with an Artifact Investigation workshop, which is a way for students (and their teachers) to get their hands on actual Buddhist objects from the museum’s Touch Object Collection. 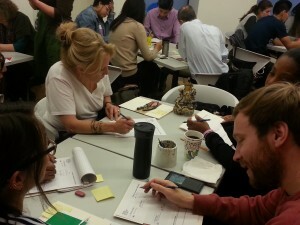 The workshop encourages close looking, making deductions using observations, and working in groups to present ideas. 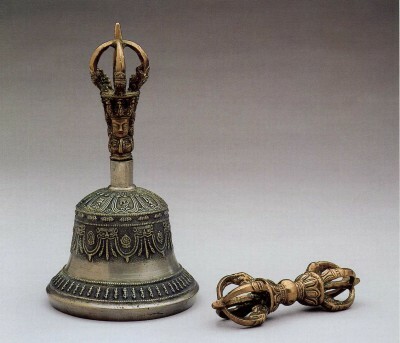 The teachers looked closely at objects like a vajra and bell (pictured above), a prayer wheel, a devotional sculpture, and others. The workshop was followed by a tour of the galleries focused specifically on ideas that directly related to the play. 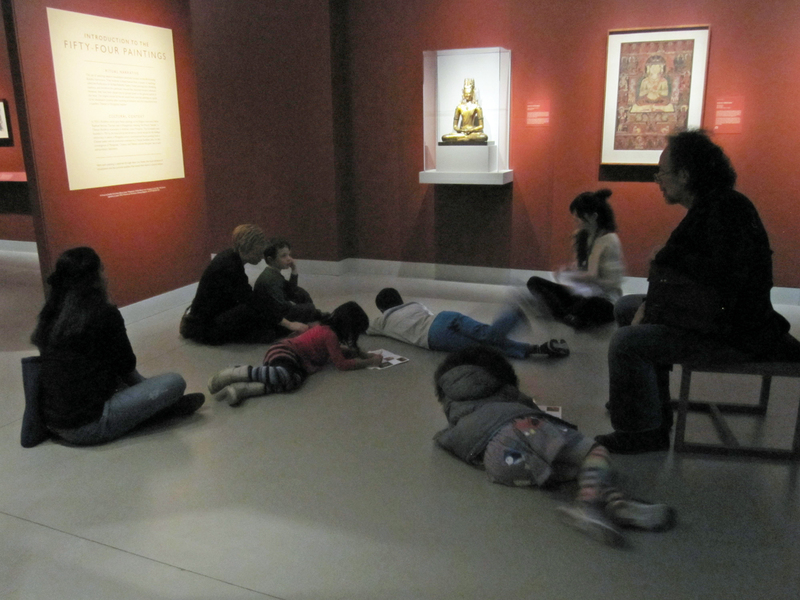 While in the galleries, the K-12 teachers explored the concepts of reincarnation, the relationship among teachers and students in Tibetan Buddhism, and the importance of ritual objects. 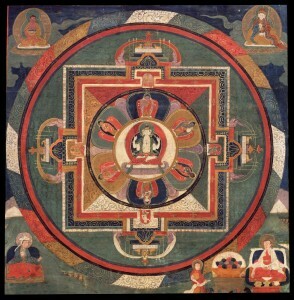 The Wheel of Life image (pictured below) is a visual representation of many of the basic teachings of Buddhism including karma, rebirth, and non-attachment. 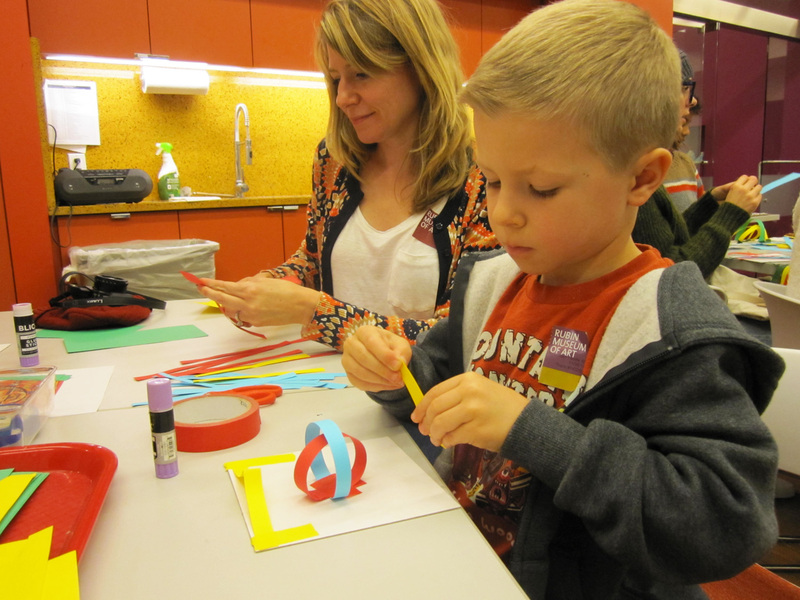 All of the teachers who participated in this program were encouraged to bring their classes to the Rubin prior to, or after, they went to see The Oldest Boy. On November 12th, a class of 9th and 10th grade students from Vanguard High School arrived at the Education Center for their Artifact Investigation. 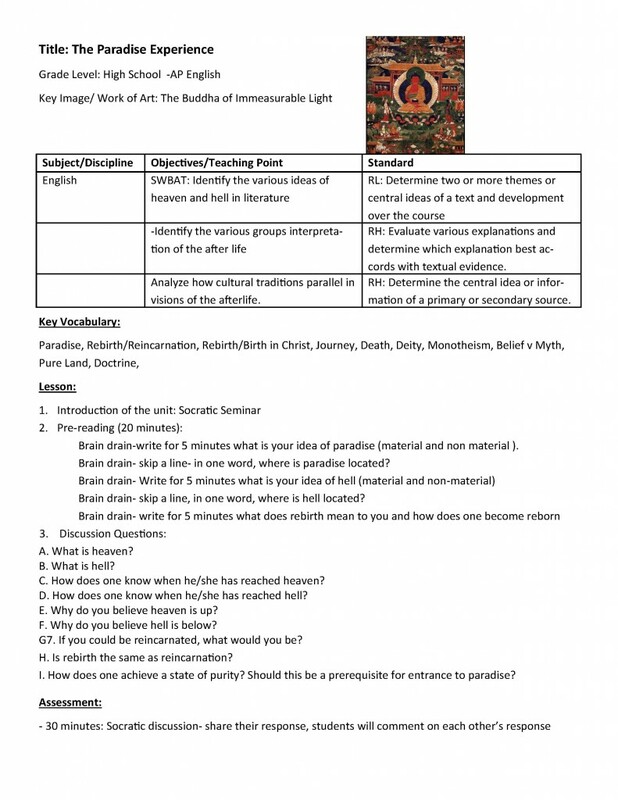 Students, haltingly at first, shared what they had learned in class about the life of the Buddha and the part of the world in which Buddhism began. The conversations really got flowing as small groups of students were each given an object from the Touch Object collection to investigate. 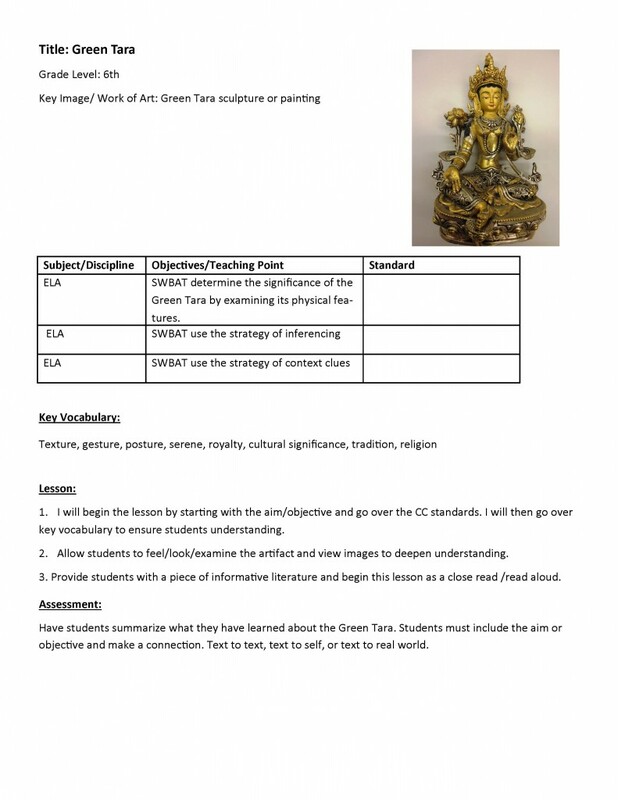 The students looked at a singing bowl, a statue of the Buddha, and other Tibetan Buddhist objects in depth before presenting their observations and hypotheses to their peers. The previously shy high school students were surprisingly eager to stand up in front of their classmates to talk about the interesting objects that they had explored. 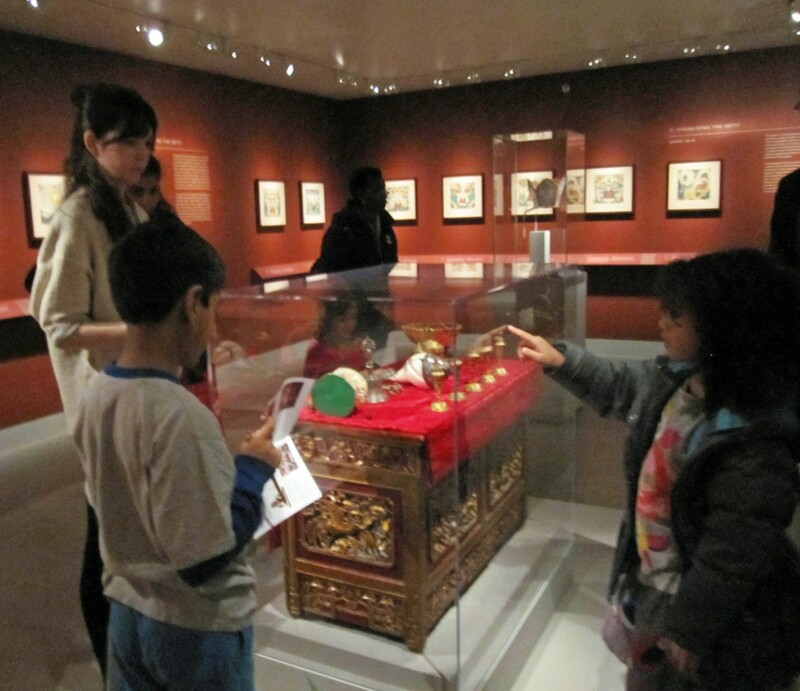 In the galleries, the students were then able to see these same objects in context and learn more about them and their use in Buddhist practice. 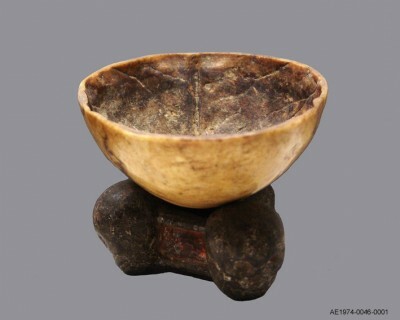 They also saw some different Tibetan Buddhist ritual objects, such as a skull cup (pictured above) that spawned a discussion on mortality, attachment, and rebirth. One of the most poignant moments happened in front of a painting of Mahakala, a particularly wrathful deity. The students were asked to put themselves in the shoes of the little boy in the play who was recognized as a tulku. 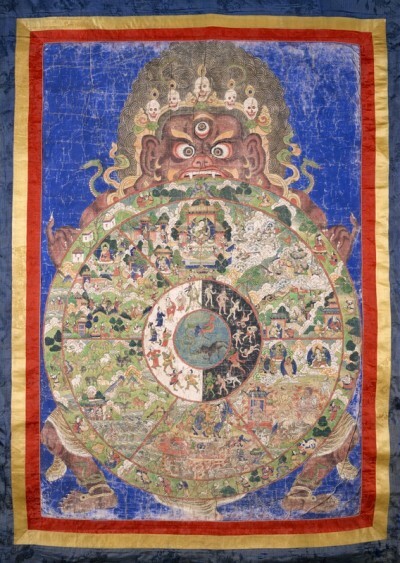 He had been born in America and raised like any little boy here, but there was the possibility that he might be whisked away to Nepal and brought into a completely new culture and surrounded by religious imagery, much of which might look like the wrathful Mahakala. The students were asked to think of one word to describe how they might feel in that situation. “Afraid,” “confused,” “traumatized,” were some of the words suggested. 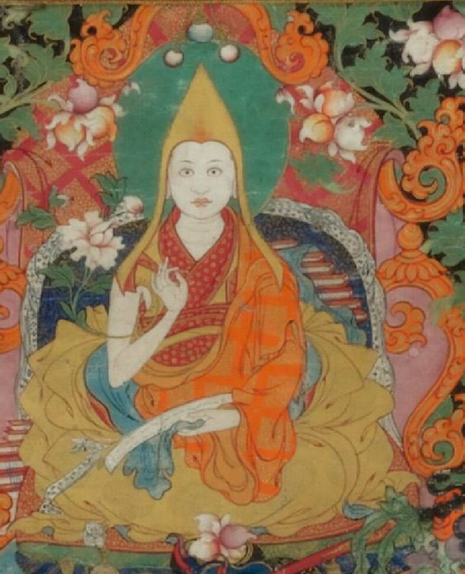 The students were then asked to look closely at a figure at the top of the painting, meant to depict an incumbent Dalai Lama, perhaps shortly after he entered a monastery. The students then realized that they were also describing the emotion shown on his youthful face. The students of Vanguard High School left the Rubin with the necessary background knowledge to best comprehend and relate to the play The Oldest Boy. 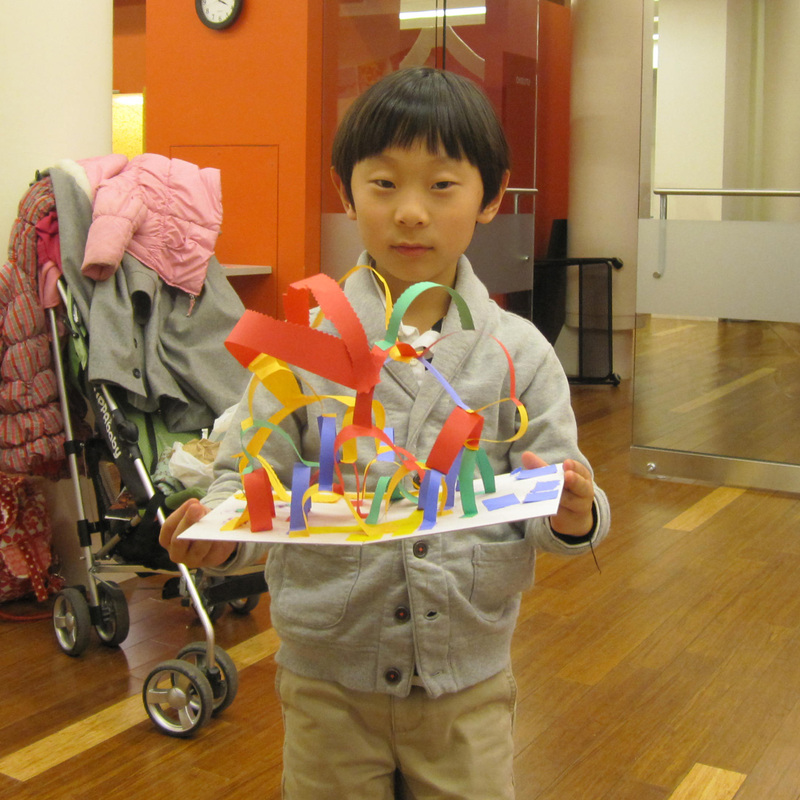 Hopefully their experience at Lincoln Center Theater will be greatly enhanced by their trip to the Rubin Museum of Art. The next batch of students who are coming in hopes of gaining a better understanding of Tibetan Buddhism before seeing The Oldest Boy will arrive in early December. Prayer flags are believed to bring happiness, long life, and prosperity to those who create them. Let’s make some!  Each color has a special meaning: blue/space, white/air, red/fire, green/water, and yellow/earth. 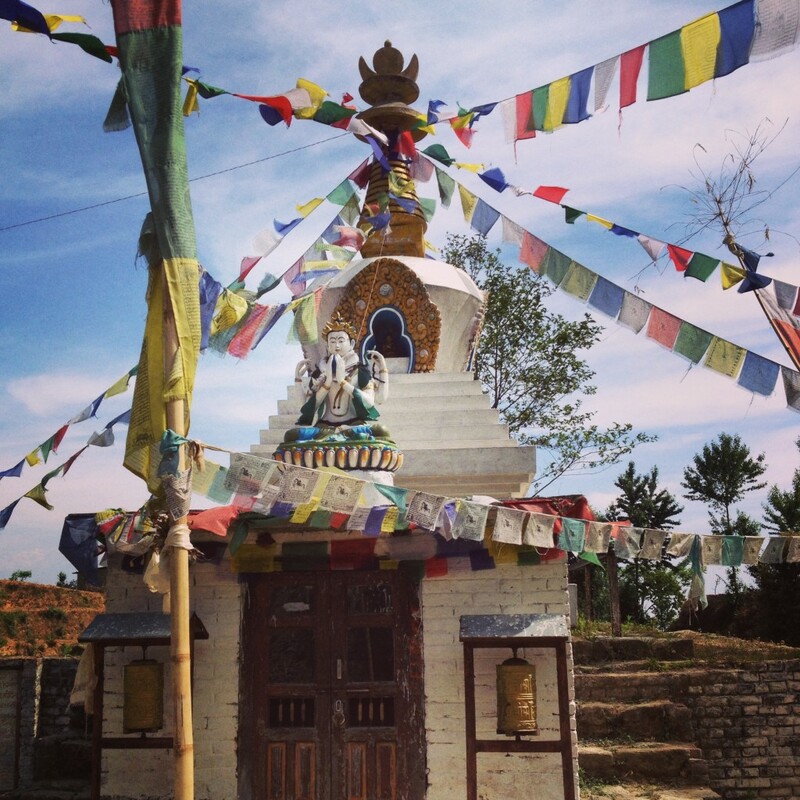 Here’s an image of prayer flags hanging from a Buddhist shrine in Nepal! 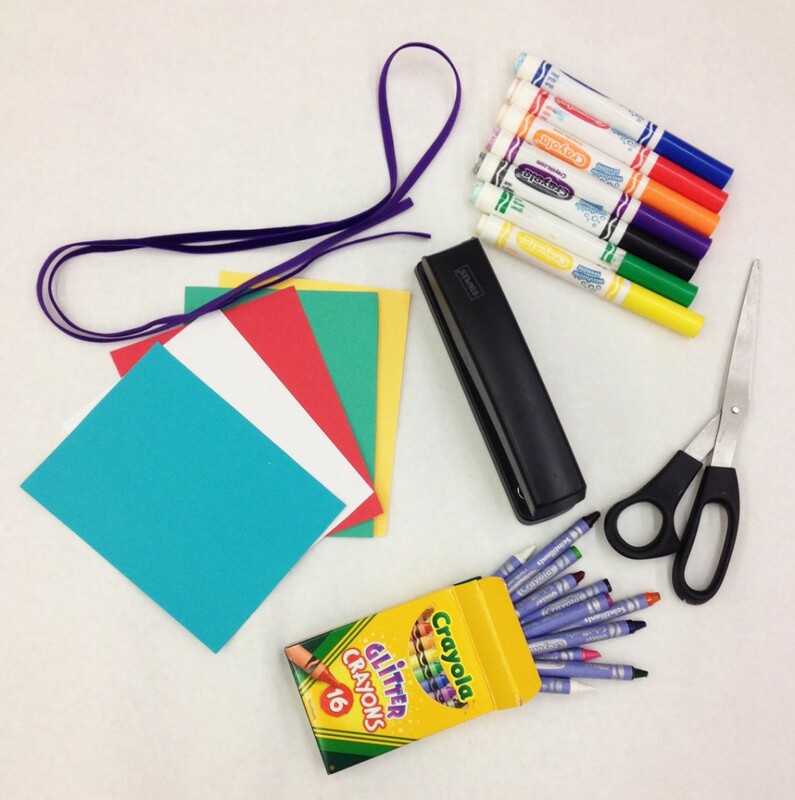 Materials needed: 5 sheets of construction paper (blue, white, red, green, and yellow) cut into small rectangles, a long piece of ribbon, stapler, and stickers, crayons, markers (or other decorating supplies). 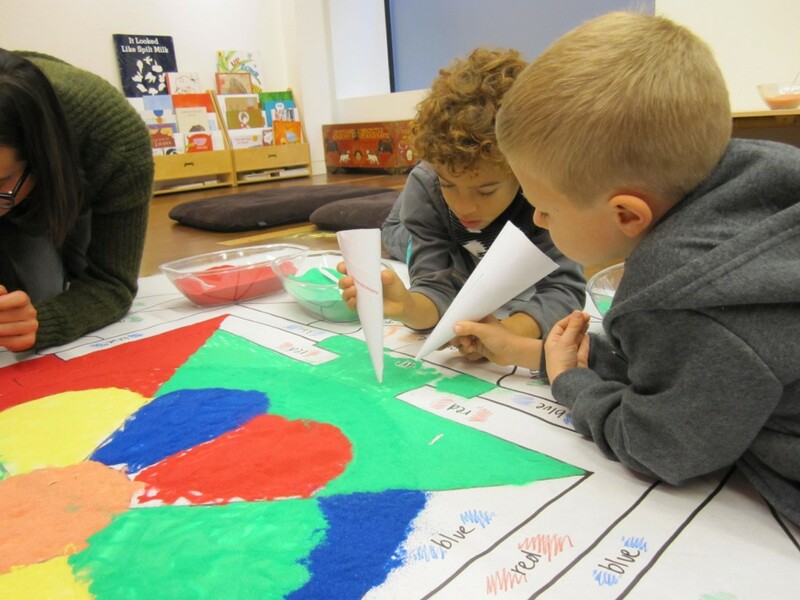 Use scissors to cut construction paper to the size you’d like your flags to be. 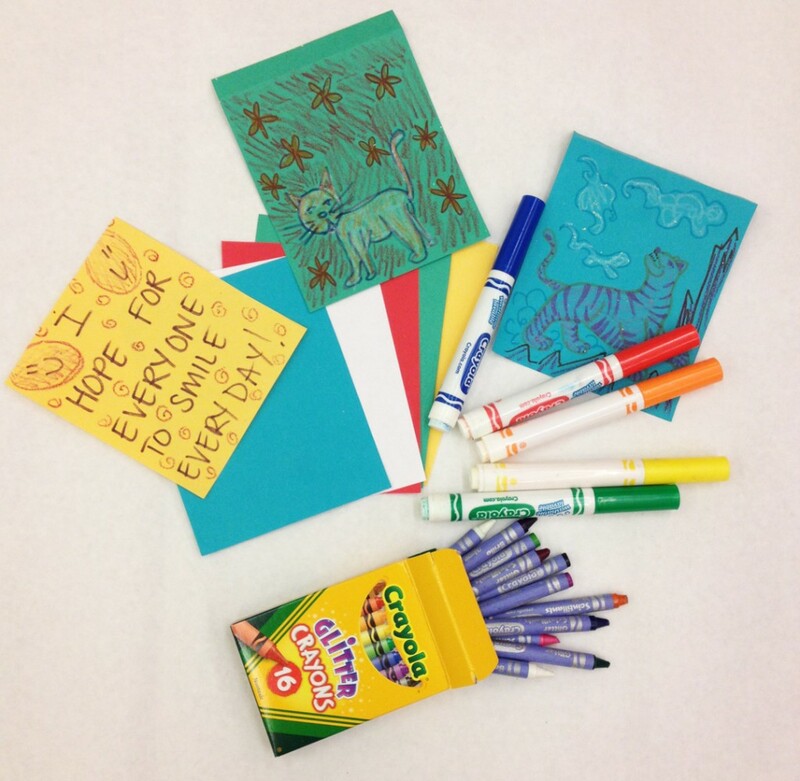 Decorate each flag using markers, crayons, stickers, etc. 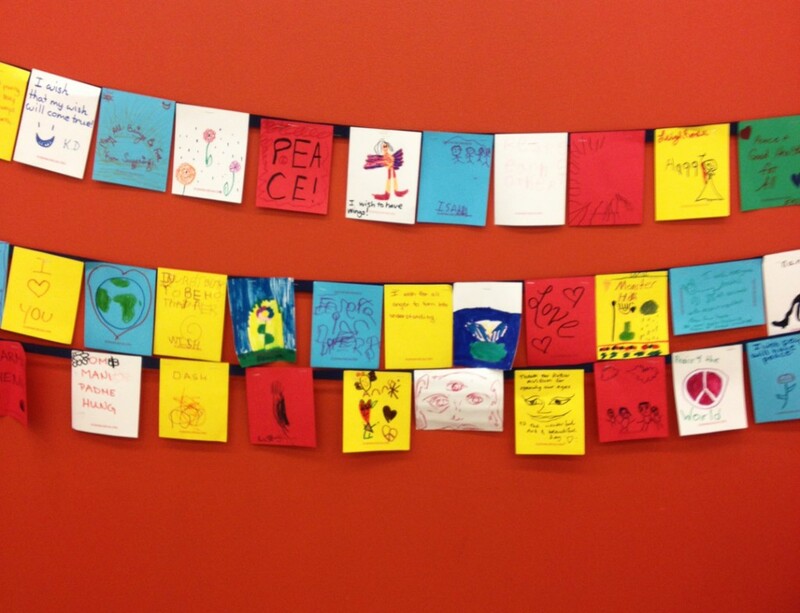 Optional: Write a special wish on each flag. Place your flags in this color order: blue, white, red, green, then yellow. Cut ribbon the length of the 5 flags plus extra on the two ends for hanging. 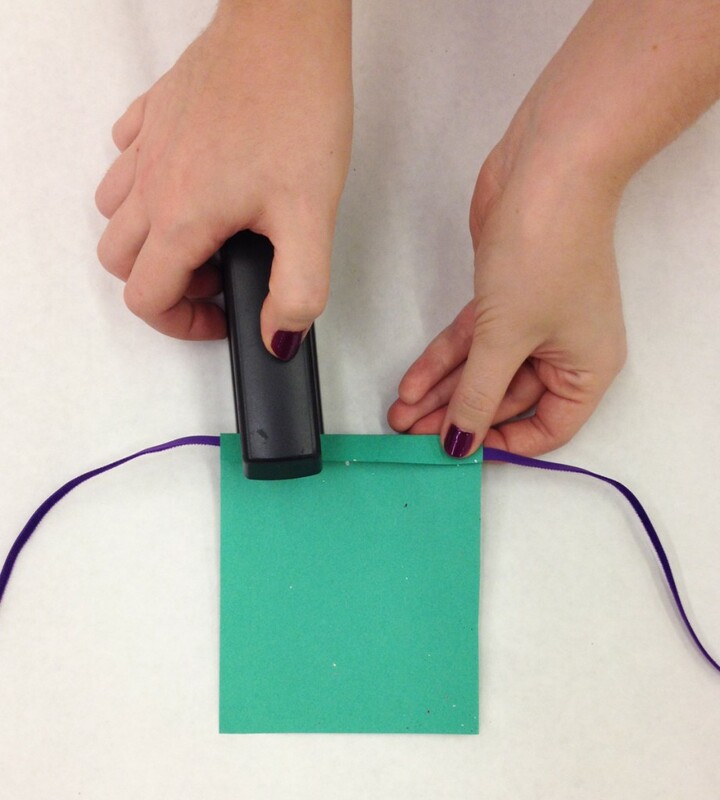 Fold the top of your flags over the ribbon or twine to form a tab and staple flags to ribbon in color order. Hang your prayer flags and let the wind carry your special wishes and drawings out into the world. Tibetan prayer flags can even be made with classes or groups and hung together to create a fun and peaceful environment! 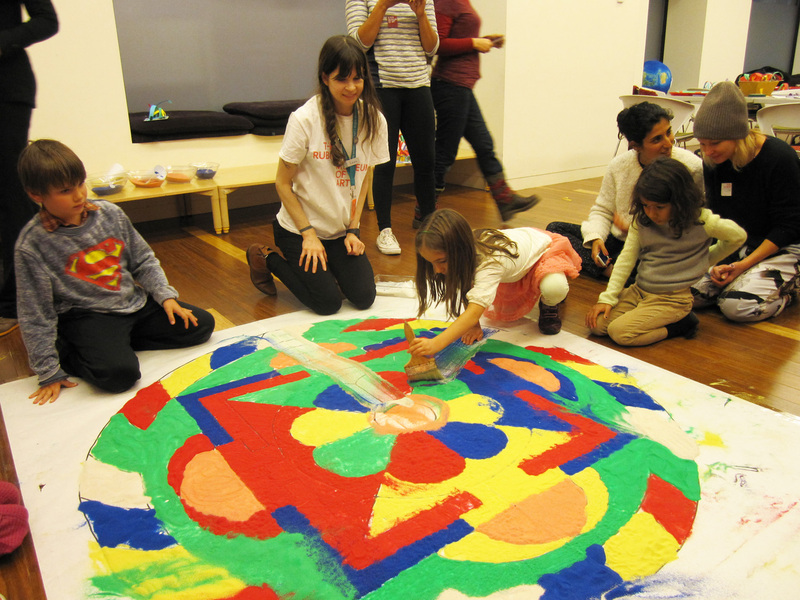 Last Saturday Family Programs held a very special Family Art Lab where we learned all about mandalas and collaborated to created a giant sand mandala. It was a unique experience for all and I think everyone had a nice take away from the afternoon. 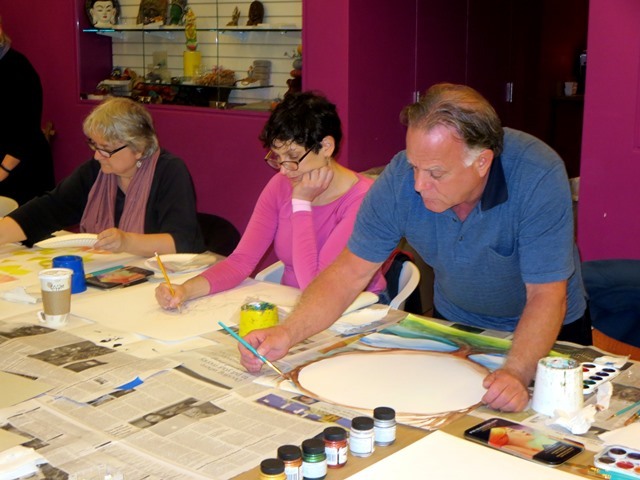 We began the workshop in the art studio, where we discovered that mandalas represent “spiritual palaces.” We also learned more about their parts and appearance: square/circle/square designs and color symbolism. 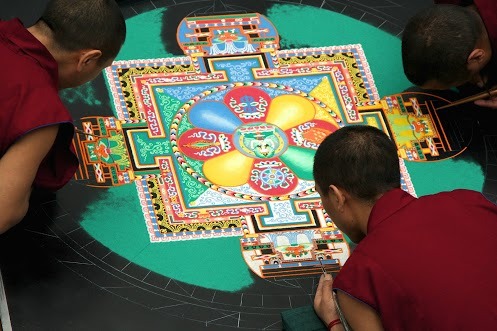 We followed our discussion by watching a video clip of Lama Karma Tenzin creating a sand mandala at the Rubin in 2009. Families watched in amazement when he quickly swept away many, many hours of work. 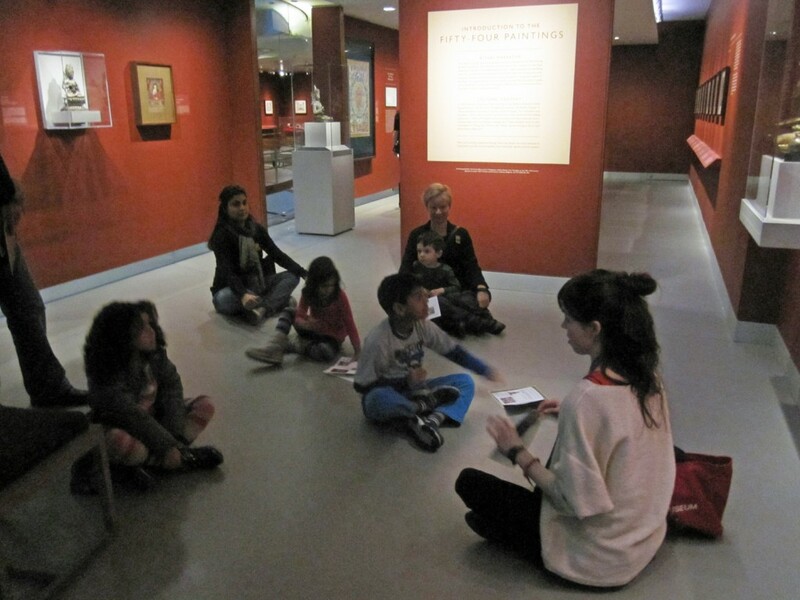 Now we were ready for a trip to the Museum galleries to search for mandalas and discover more about their meanings. 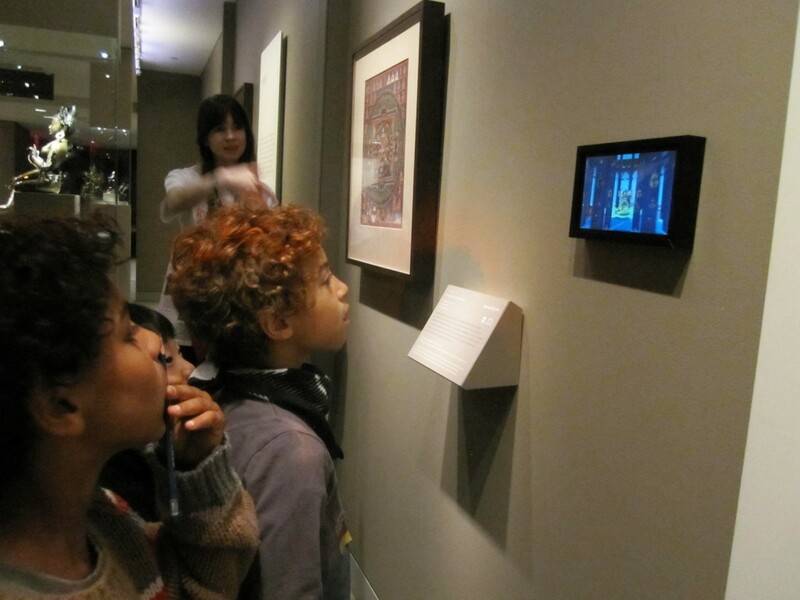 Families were fascinated to discover the video, alongside a painted mandala in Gateway to Himalayan Art, that explores the interiors of a mandala. We looked at a stupa and discussed how it has similar shapes to a three-dimensional mandala and can also often represent a mandala. 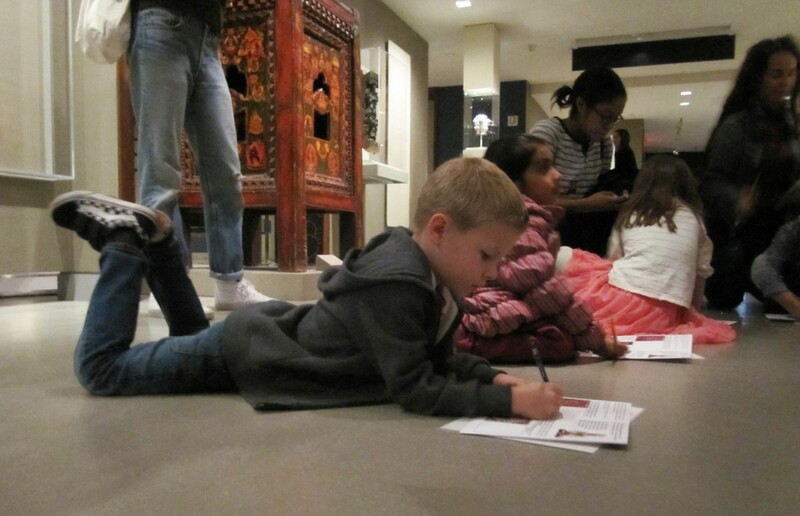 Next, we moved on to the 5th floor, All-Knowing Buddha exhibition, and recreated the posture of Buddha Vairochana – lotus position with hands in our laps. After a few deep breathes, we began to feel a sense of calm and relaxation, a feeling that can be difficult for many of us to achieve in our busy city lives. 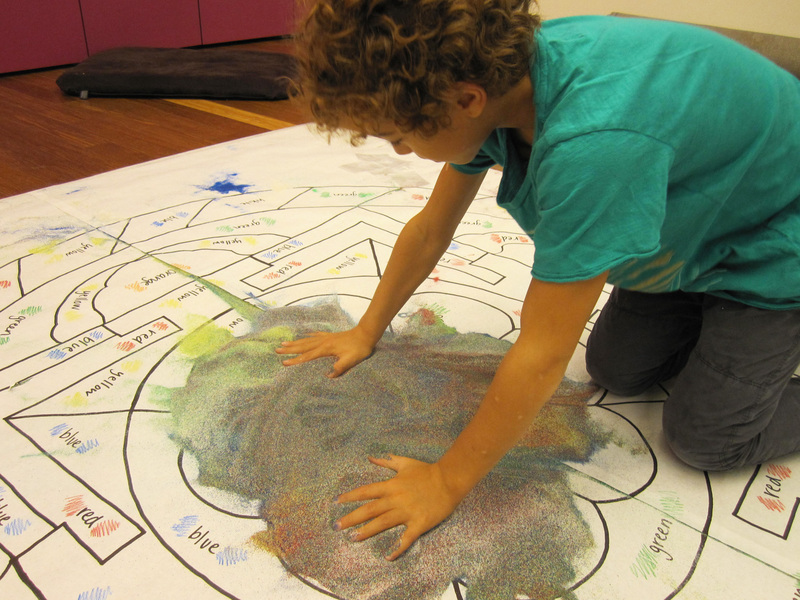 We continued our tour with more close looking and drawing activities in preparation for our mandala-making session in the art studio. 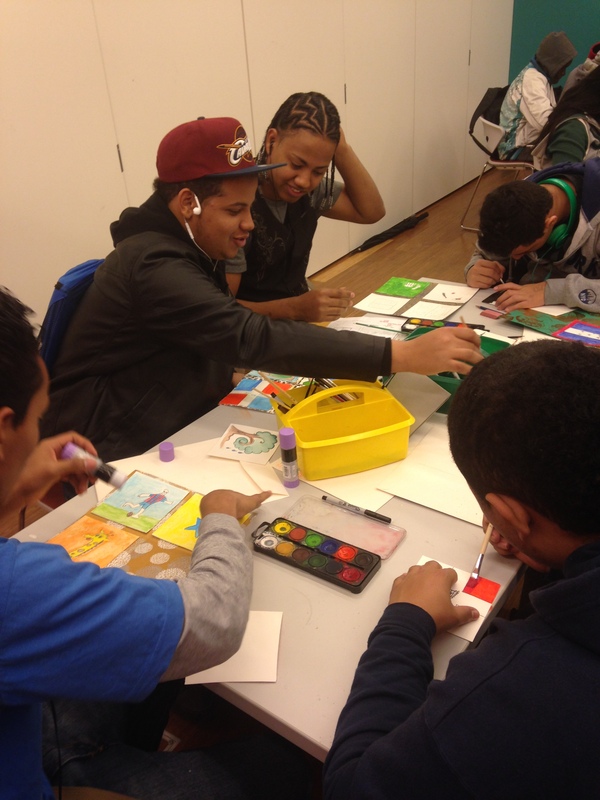 We returned to the art studio, full of new knowledge and ready to create. 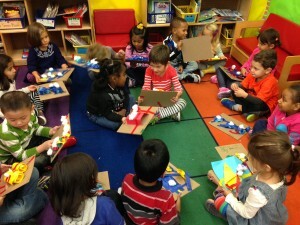 We began by creating 3D mandala sculptures, using colored paper, cardboard bases, glue and tape. 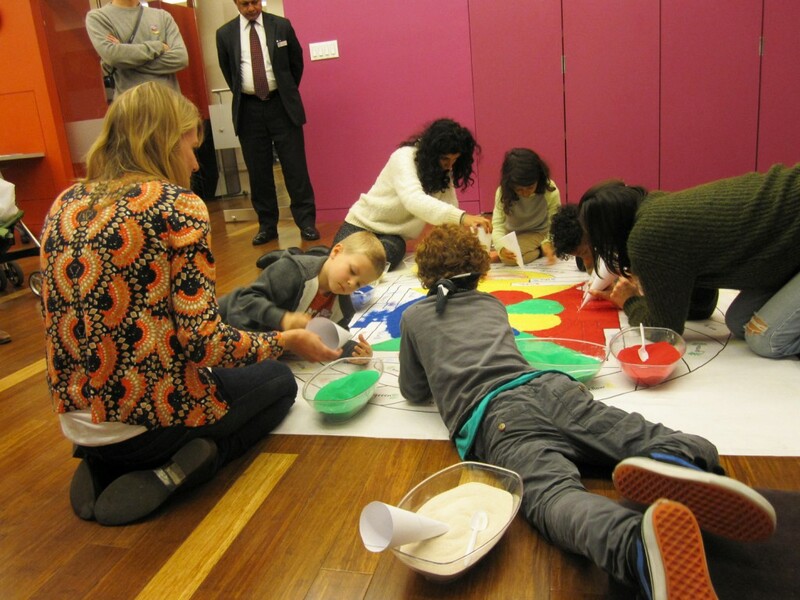 The finished 3D mandalas were fantastic and really showed the collaboration between the adults and children. 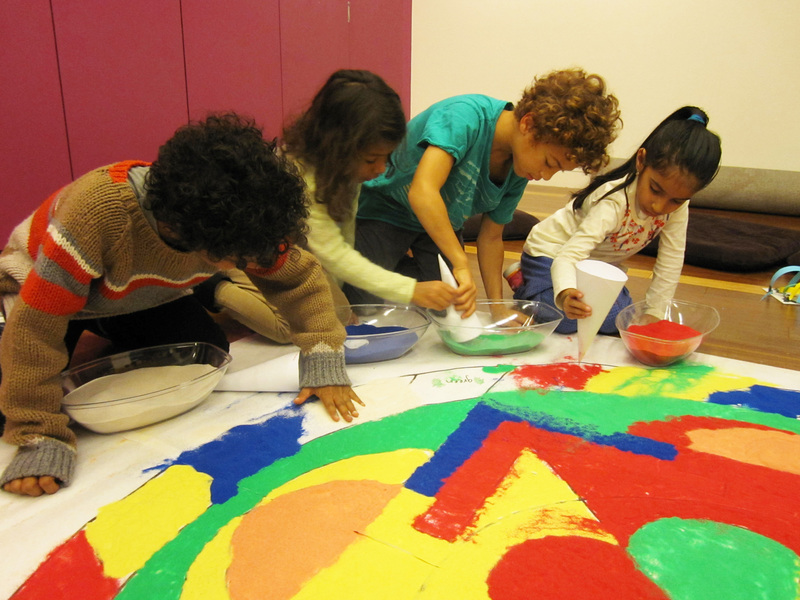 As some families were busy creating their mandalas, we rotated working on the collaborative sand mandala. 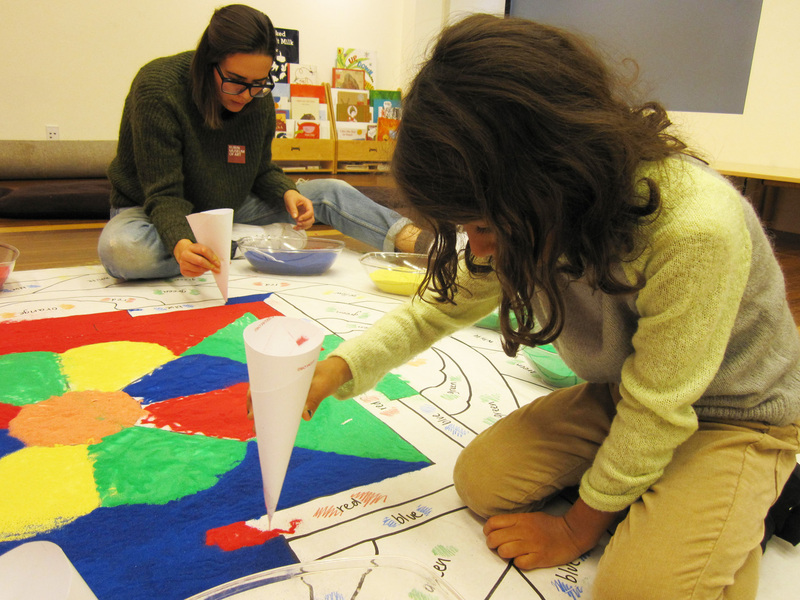 Families used homemade sand cones (made of stiff paper and tape) to help disperse the sand into the mandala. Many children (and adults!) discovered this to be a very calming, meditative process. It was fantastic to watch everyone work so carefully and with such amazing teamwork. After much hard work and care, the sand mandala was complete. We gathered around to admire and appreciate our creation and then it was time to sweep it all away! Before we swept, we reminded ourselves of the meaning behind sweeping the sand away – impermanence. Nothing lasts forever, so let’s appreciate this moment in the present. The children took turns using the brush (the same one used by Lama Karma Tenzin!) to sweep the sand toward the center of the mandala. We swept until all of the sand was piled at the center and then I dispersed small sand keepsakes to each participant as a memory of the mandala and their time at the Rubin. 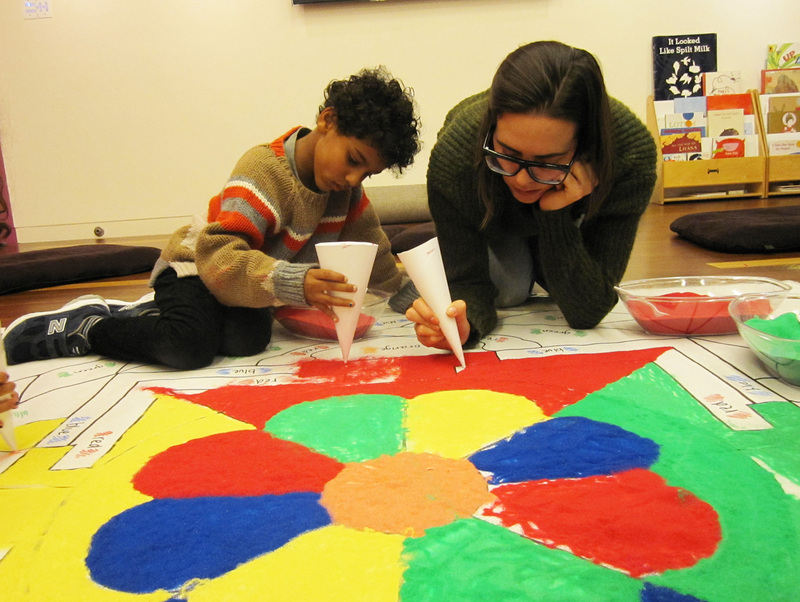 The experience of creating and sweeping away our sand mandala was truly a special one for all families and my assistant, Hannah, and I. 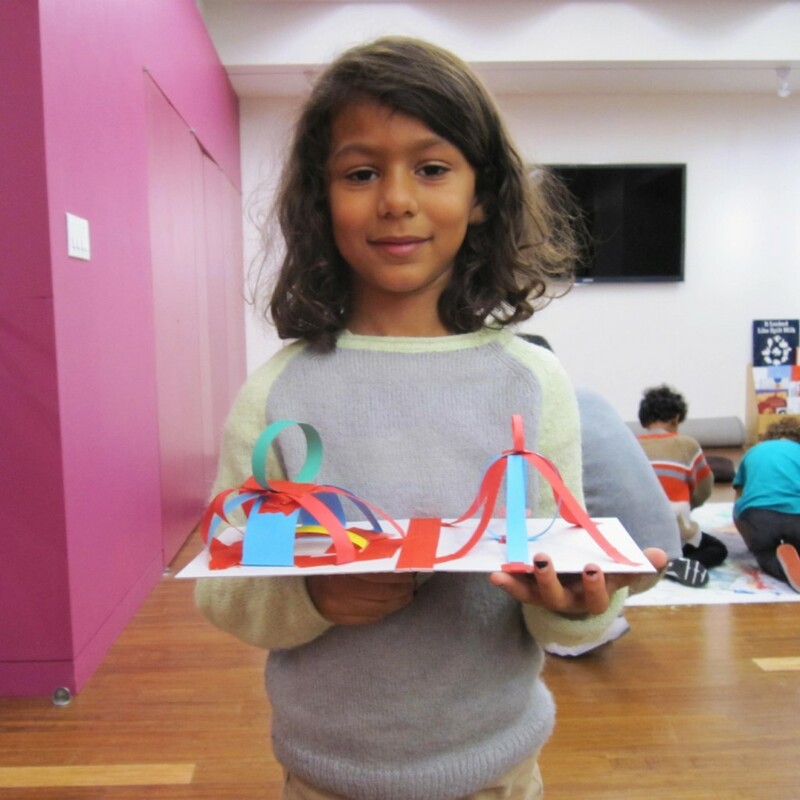 We can’t wait for next month’s Book Art Family Art Lab, where we’ll be learning the art of bookmaking and will create our own special pop-up books! 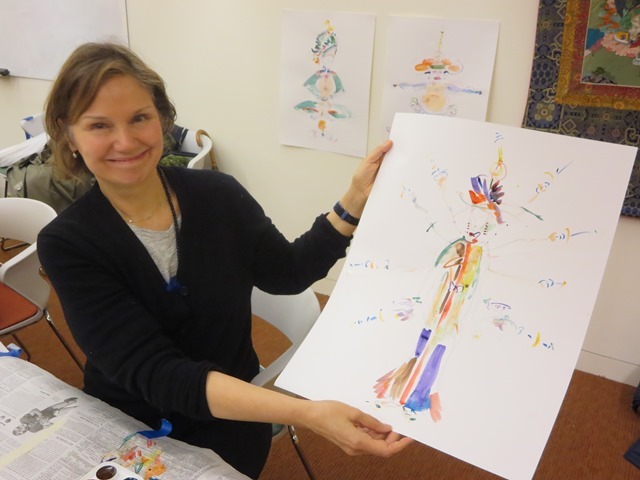 The Adult Education Team at the museum offered an exciting course in October, Creating Deities: Exploring Inner Guides of Strength, Love, and Insight, hosted by the dynamic and inspiring artist and educator, Janet Morgan. Attendees primed their creativity pumps with Janet while tapping into a wellspring of timeless wisdom. 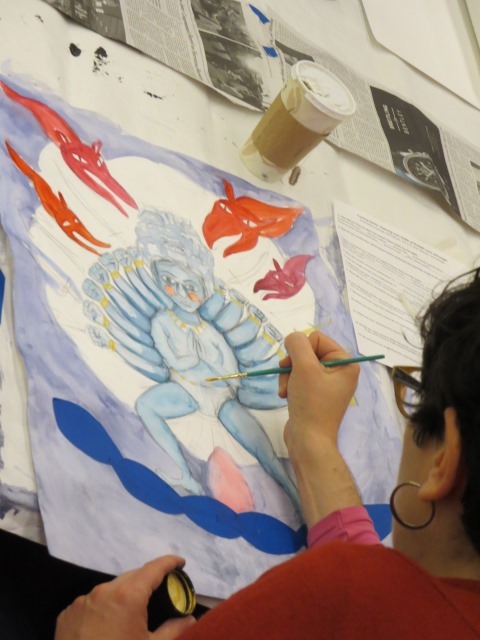 Together, we explored the archetypal power of Hindu and Buddhist deities in the galleries through dynamic movement, and by creating works of art that helped participants tap into their own inner deities of strength, love, and insight. 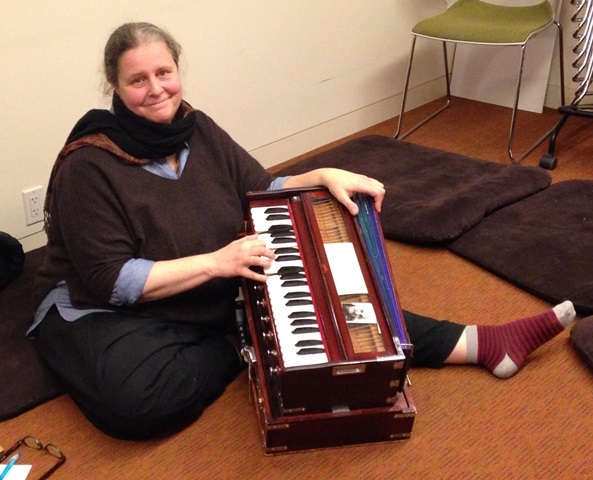 For the final class, Shyama (Julia Chapin) brought her harmonium and treated us to a Kirtan of traditional Hindu devotional music in the Bakhti tradition. Shyama also composed beautiful original songs inspired by the works of art made by attendees. It was a magical evening. 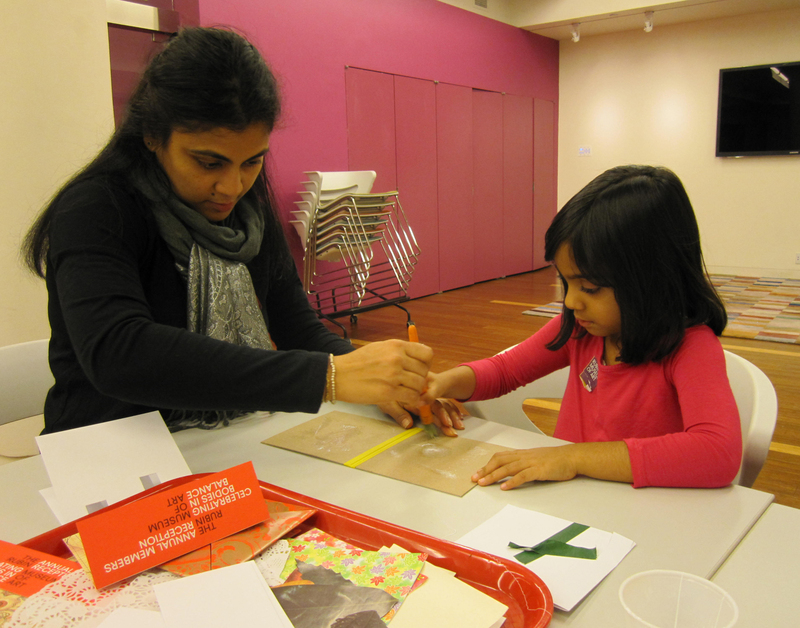 We look forward to welcoming Janet and Shyama back to the museum!